Today’s BJAMS ski program featured a great run on the Bruce Trail. 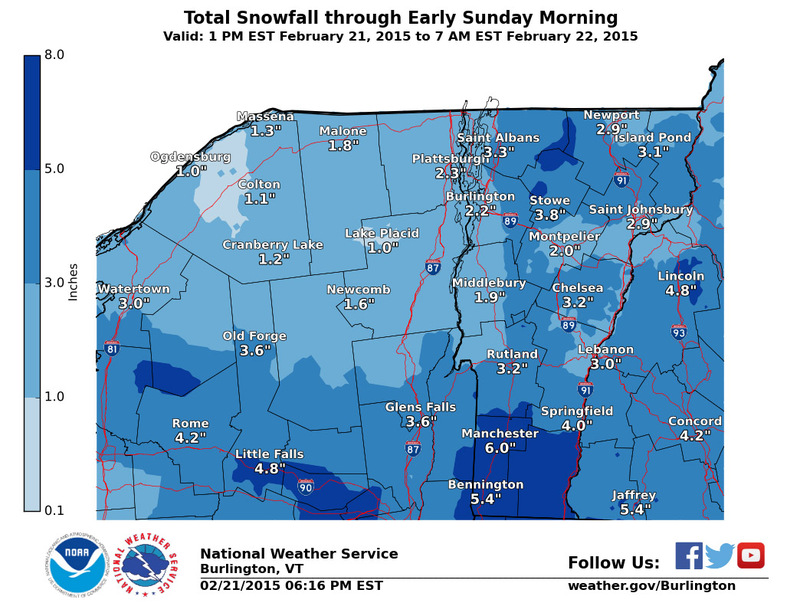 It’s March, the season for deep snowpack and long days in Northern Vermont. 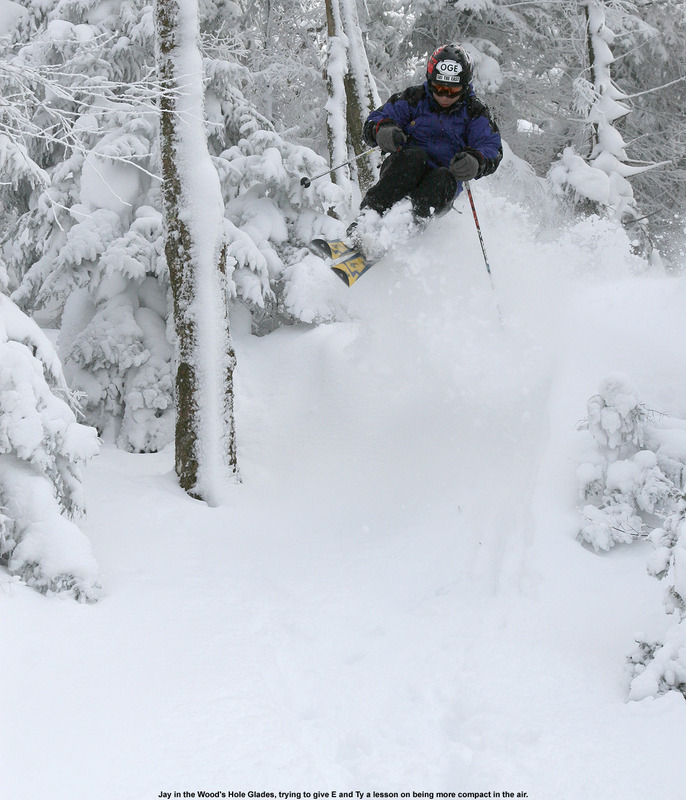 That also means that it’s prime time to make use of that ample snowpack and enjoy some of our legendary sidecountry and backcountry ski routes. For last week’s BJAMS ski session we focused on The Chin and put together a nice tour featuring Profanity Chute and the Hell Brook Trail. Today it was time to switch action to The Nose for a combination of Old Nosedive and the Bruce Trail. We’ve had a great run of storms and wintry weather during this second half of March, and it’s definitely time to make hay. 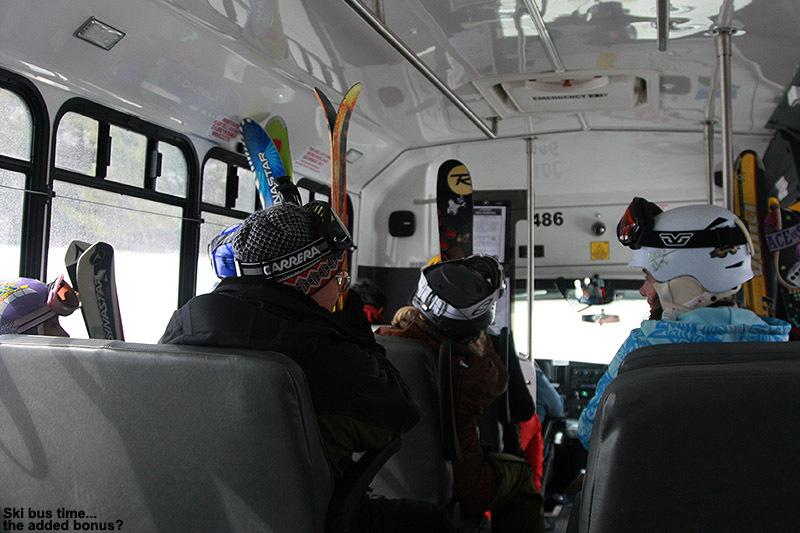 A number of students were unable to attend ski program today, so there were some small groups, and any of them that were interested in a trip down the Bruce joined up with us. From the top of the Fourrunner Quad, those that wanted to ascend joined me for a trip up Old Nosedive, which I find is a nice way to get in a bit of hiking and extra turns before diving into the Bruce. The condition of the snow was really excellent today – all the way from around 4,000’ to down at roughly 1,000’ at the bottom of the tour. 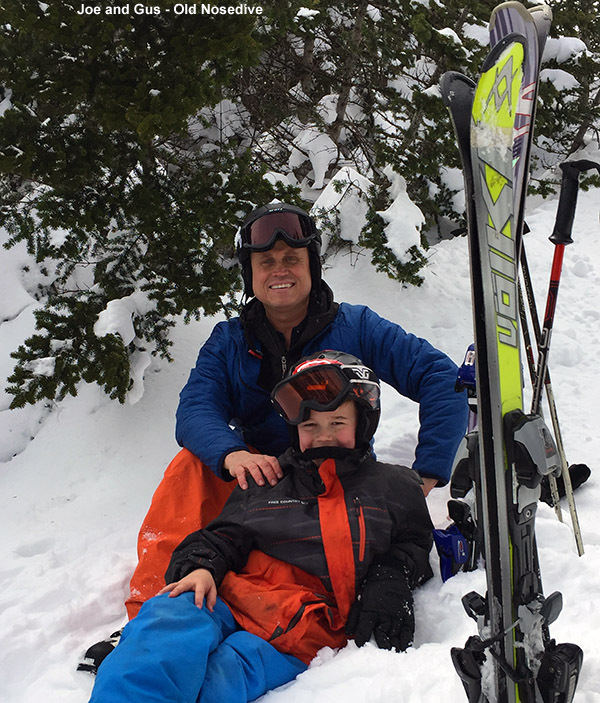 It was quite wintry up top, but even in the lowest elevations the snow was dense enough to hold up well for fresh turns, just like Dylan and I had experienced yesterday at Bolton Valley. 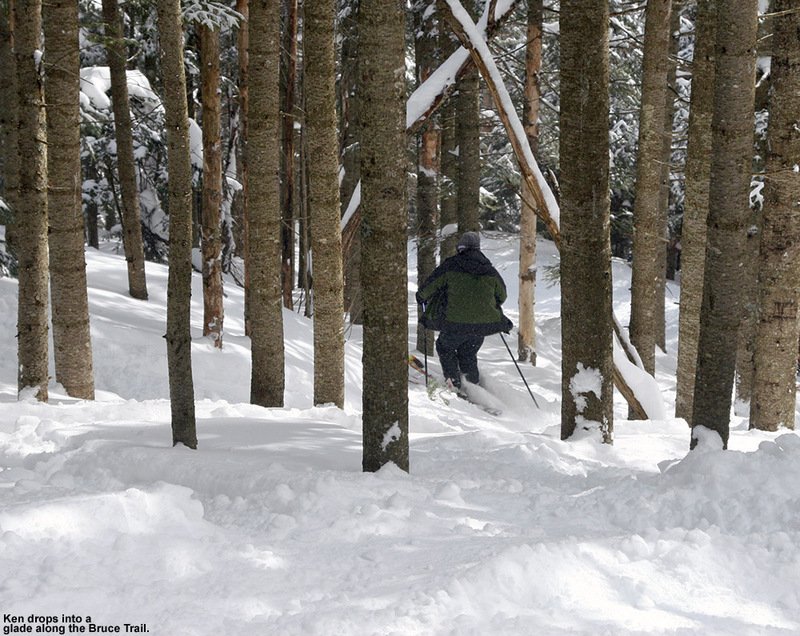 There was still ample untracked powder available off the sides of the Bruce, and as usual once we were down into the open hardwood areas there were lots of great lines to explore in the trees. This morning, Dylan said that we should go with Telemark skis for today’s session if our focus was going to be the Bruce Trail, and while I’d planned to go alpine, I agreed and ended up going Tele. It was totally the right choice, especially since the coverage and snow conditions were so optimal. I was happy because I felt really dialed in and my transitions felt incredibly quick, and Dylan was also really psyched because he skied so well today. He says that he always wants to run the Bruce on Telemark gear now. Of course he got to experience it on a great day. I’d put today in the top 25% of conditions for the Bruce – there was so much soft snow and powder around, and even those most difficult to cover, south-facing shots were virtually blemish free. We capped off the run with a trip to the Notchbrook General Store for snacks, and a ride on the Mountain Road Shuttle back to the Spruce Peak Village. Greg said that the last time he skied the Bruce Trail was about 35 years ago, so it was really neat that he got the chance to do it again after such a long hiatus. We had time for a few more runs on Spruce once we got back, and found that the quality of the snow was still really nice. This was just the way a March ski day should be! 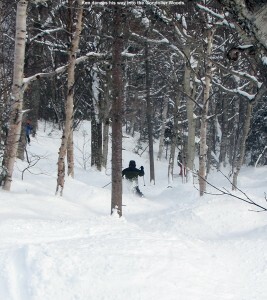 Wiley getting out into Mansfield’s trees for some powder today. 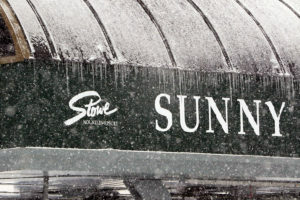 After our morning session at Bolton working with Josh and Mike, we headed off to Stowe for BJAMS ski program. 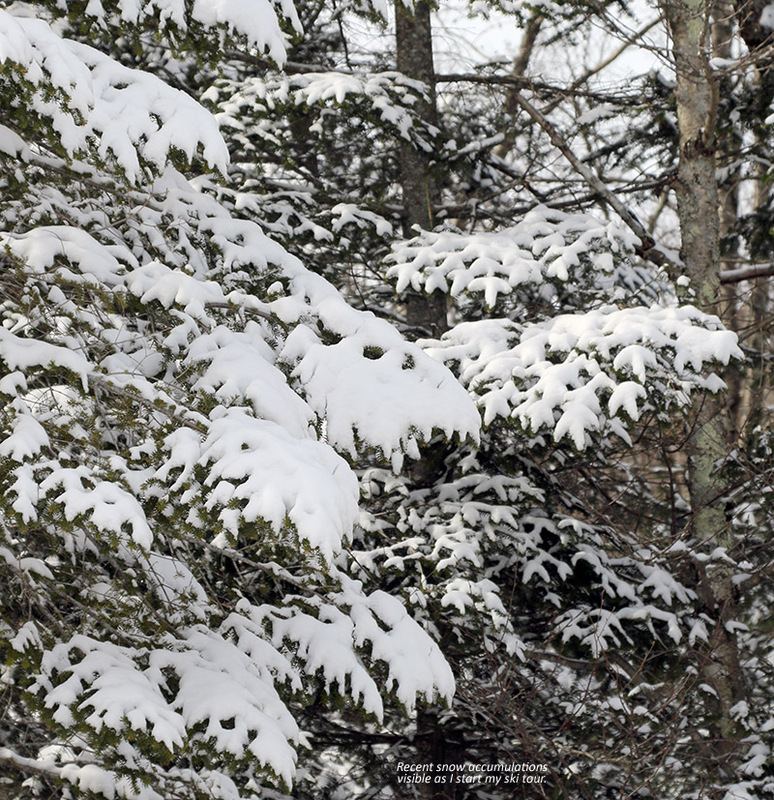 With the recent fresh snow in the past couple of days and the bright sun of late March, the alpine areas of Mansfield looked blindingly white as we approached from the south. The overall timing of the trip was actually quite good, and we were even able to grab some lunch at the Great Room Grill before the start of program. The line for the main grill area was long, and at first I thought it might be groups of ski racers from the races going on, but upon hearing all the British accents, I quickly realized that that’s who it was. 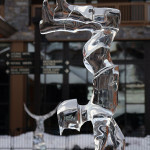 They’re certainly getting some midwinter-like conditions on their ski vacations this weekend. After lunch we suited up and headed to the base of the Spruce Peak lifts to gather our group for the day. There were some absences, so there were only six students (Ty, Dylan, Wiley, Elizabeth, Luc, and Jonah). I had Joe to help me as a second coach though, so we had a very good coach to student ratio for exploring whatever we wanted. Based on the snow conditions, and in the interest of expanding the student’s repertoire and keeping things fresh, I decided that we should take a trip to the Outer Planets area. I can’t recall the last time I’d been out there, and I didn’t really have a chance to make a recon trip this season, but I knew everyone could handle it. I told the students that we’d be heading out past Angel Food on the traverse, and that we’d play it by ear as we scoped out the terrain. The traverse was in great shape, and the powder up there was midwinter light aside from areas exposed to significant sun. In those areas you could see that powder was just starting to take on some melt, so we knew that we might want to factor that into our skiing if we had options. Once past Angel Food, we continued on the traverse for a few more minutes and headed upward with some side stepping. I didn’t recall ever seeing any specific trail signs in the area, but I told the kids to keep their eyes peeled for anything they might see in that regard. I didn’t see any obvious trail signs, but I did see an interesting piece of artwork on a paper birch just above the traverse that presumably had some interesting meaning – it was a pair of eyes with almost mask-like surroundings. Not long after passing that image, I felt like we’d gone far enough and opted to take the next obvious line for the descent. I chose one with a couple of tracks, which in this case was good; we were doing a bit of exploring, but I didn’t want to take the kids on anything too exotic that might push things over the edge. Eventually as one gets farther and farther into the notch, things can get overly steep, and that’s not what we were looking for. The line we got into, perhaps Yeranus but I can’t say for sure, was well defined, much like a mini Angel Food. 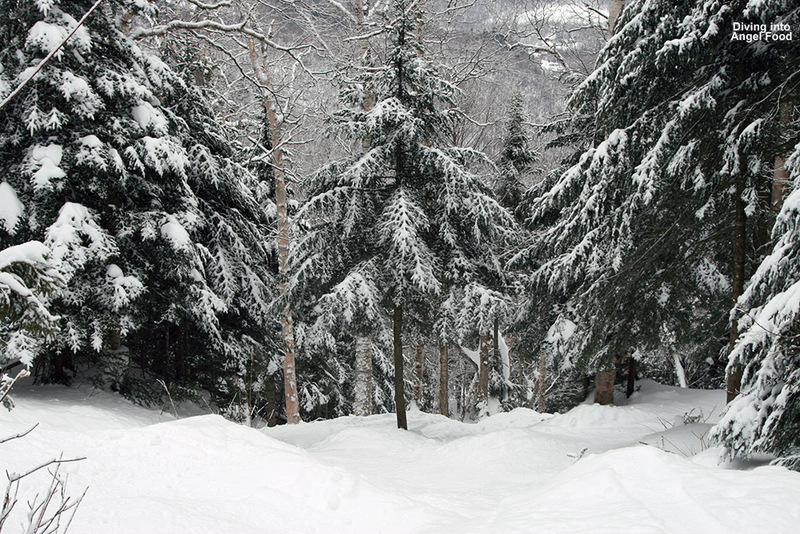 As we pushed farther down the line, it got a bit less defined at times, but in general it didn’t matter because the hardwoods all around were eminently skiable and we could just fan out wherever we wanted. 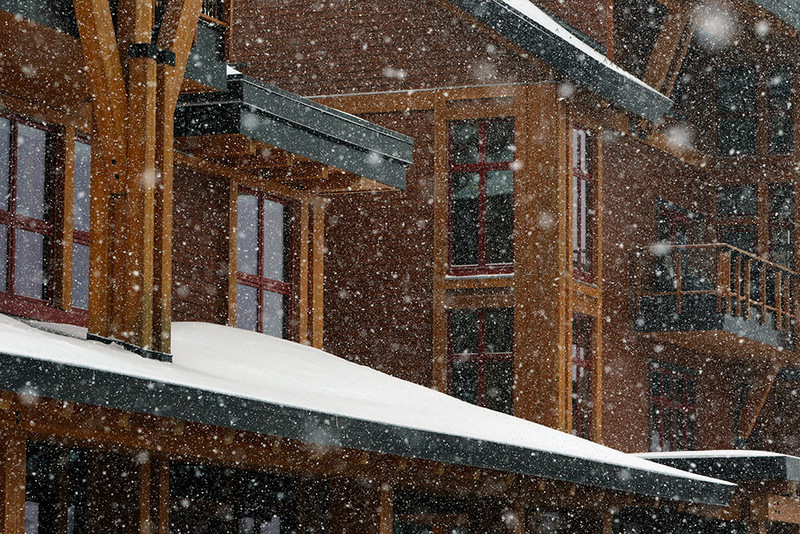 The snow quickly transitioned from somewhat settled midwinter powder to a wetter powder as we descended. Fortunately, it skied well, and the main issue arose when you’d stop. 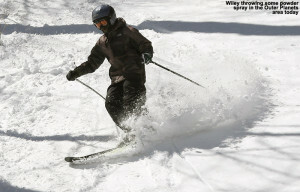 You’d melt enough snow to make it sticky, but as soon as you started skiing that went away. The snow continued to transition until we got down into what was becoming a very supportable spring-type snow. That really skied well with a few inches of dense proto-corn that shaved away nicely over a supportable base. A few minutes into the run, I could see that the terrain was going to be rolling over down below us, and it naturally got me wondering if we were going to have to deal with some sort of cliffs. When we finally arrived at the top of that section, I could see that a pair of very steep chutes lay below us. I was fairly committed to the right chute, which was the narrower of the two, and it did have a bit of ice in the throat that I could navigate with a bit of side-slipping. I let the kids know that the chute to the left was larger and offered a better entrance, so those who could, headed that way. Luc was committed to the chute I was in, and got hung up in there and lost a pole below that tumbled down to me. It took a couple minutes of strategic ski placement, and me tossing up his pole, but he managed his way through. Meanwhile, Dylan had circumvented the whole deal simply by skiing the snow just to the left of both chutes – the snow was great there and the trees were quite open. I love how he finds these great ways around obstacles. Those two chutes quickly converged into a beautiful gully that must have been 30 plus degrees in pitch. I suspect it’s the pièce de résistance of that run, because it’s a few hundred vertical feet from there down to the notch road. The group skied most of it before cutting off to the right where a tree had fallen that required a bit of a limbo move to get past it. 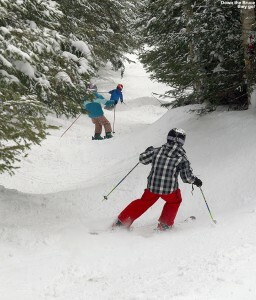 I later learned that Ty, or course, ducked under the tree and skied it anyway. On the notch road it was about 10 minutes of traversing before we were back to Stowe’s equipment barns and the Gondola area. There was some grumbling about the trek to get back to the lift, and everyone was dropping layers and getting warm in the sun. It was hard to complain when we were out there cruising along on the snow on such a great spring day, but as fun as it was, I knew I wasn’t going to push the kids to run another lap in there. 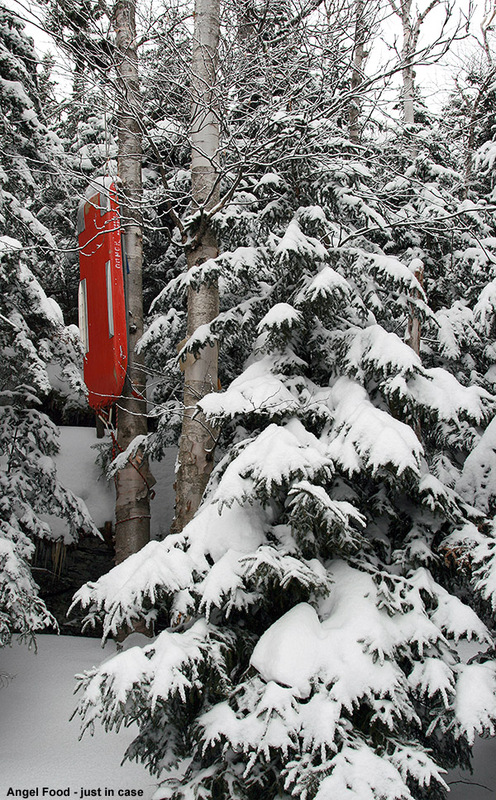 We’ll have to get back there some time after a nice dump of snow and see how that gully skis. 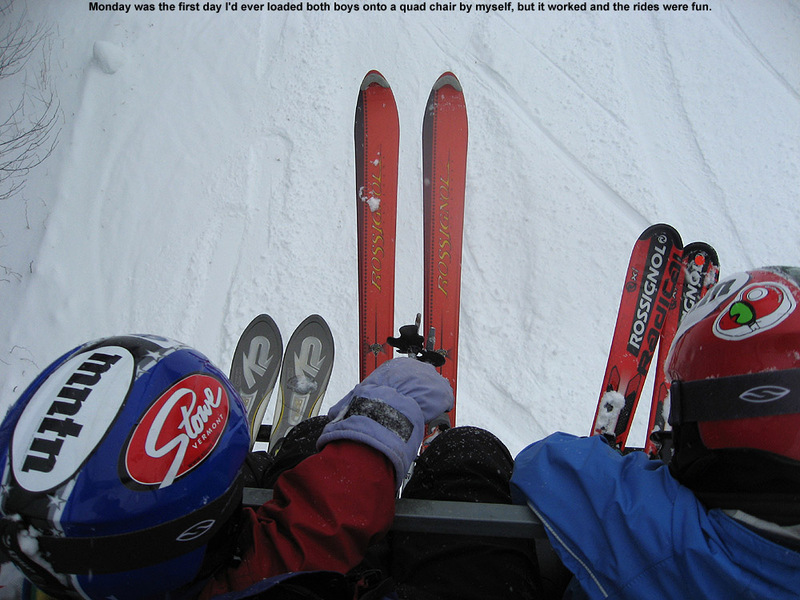 We made another Gondola run on Gondolier and found the on piste conditions rather mixed – there was some winter snow, some areas of hard refrozen stuff, and some areas of nice soft snow lower down. We took a break at the Midway Lodge, and based on what we’d found for snow, Joe and I decided that it was best to head back to Spruce Peak and see if we could find some good spring snow on its south-facing slopes. The upper elevations of the Sensation Quad were still high enough to be generally a mix of midwinter snow and refrozen snow, and it really wasn’t until we got down to the Meadows elevations before the snow was consistently spring-like. The day concluded with a BJAMS ski program tail-gating party in the parking lot of the Spruce Peak Performing Arts Center. Although temperatures were only in the low 30s F, there was no wind and that late Much sun was doing its work. It wasn’t the kind of day that you’d be stripping down to your shorts, but in ski gear it was very comfortable, and indeed we saw a lot of groups having similar parties today. 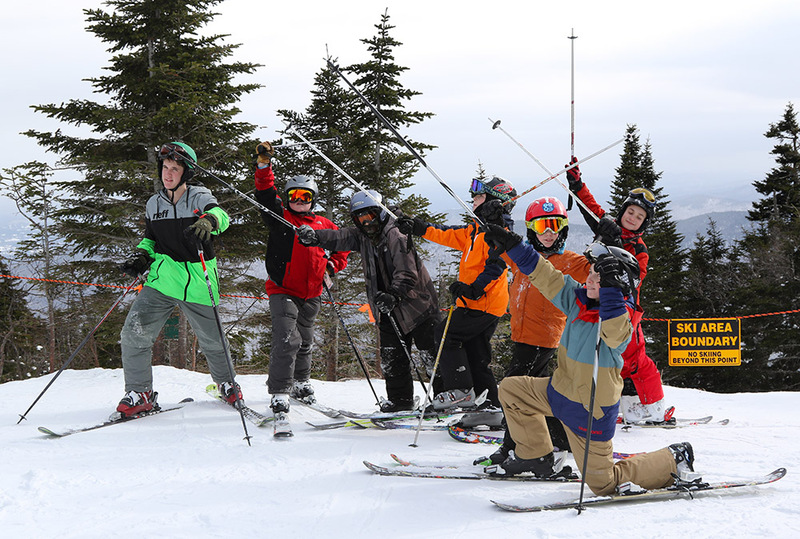 It was a fun way to finish off the official ski program season, although I think many of us will be back in the coming weeks for some additional ski days, even if they aren’t official program days. The nice part about those days is that we can play it by ear with respect to the weather, and there’s no need to cancel if the weather is sour. 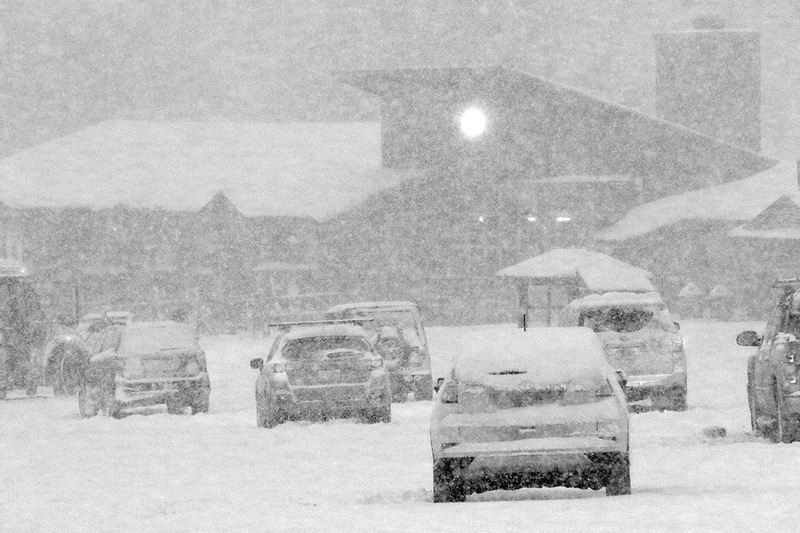 The forecasts suggest we’ve got some additional storms coming as we head into April, so we’ll see how much extra snow we’ll have before the season finishes up. The boys headed up to get some turns on Old Nosedive today. 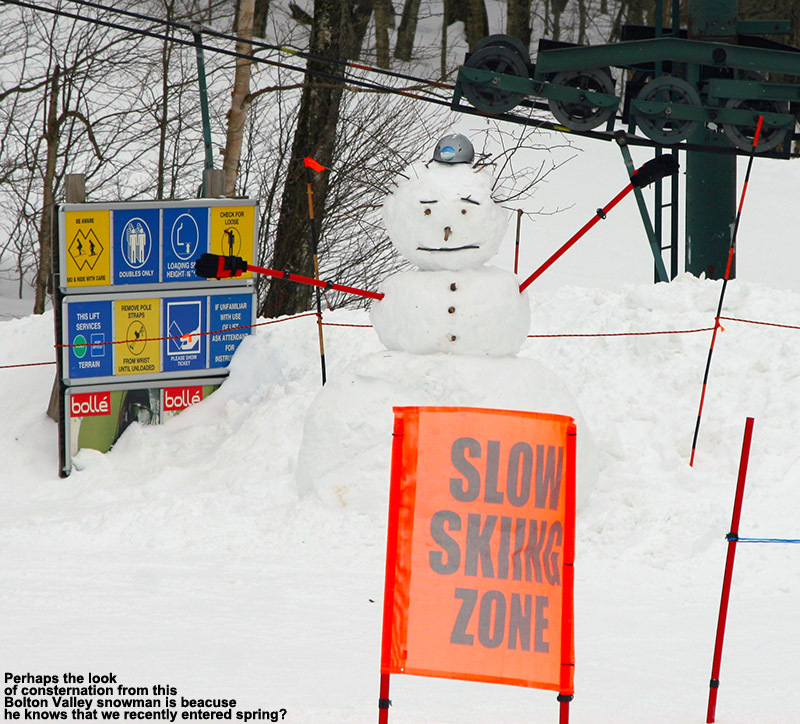 Today it was back to Stowe for BJAMS ski program, and a few key considerations came into play as I planned out our session. New snow this past week has been fairly minimal, but it’s also March 1st and we’ve got a healthy late-winter snowpack hovering around 80 inches at the Mt. Mansfield Stake. 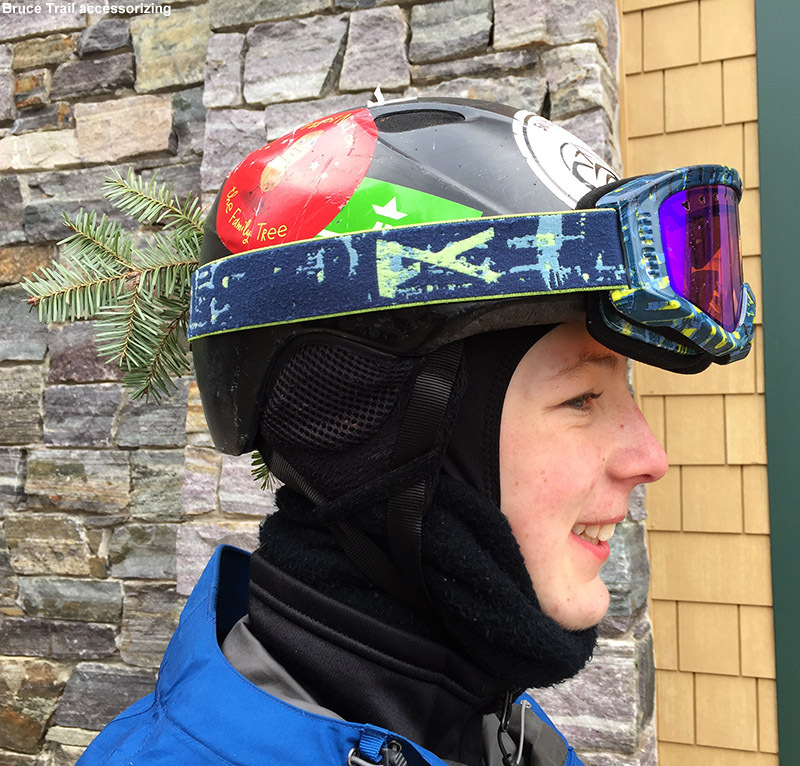 Temperatures were expected to be in the 20s F, so that would plenty comfortable for any extended backcountry or sidecountry runs with the kids. 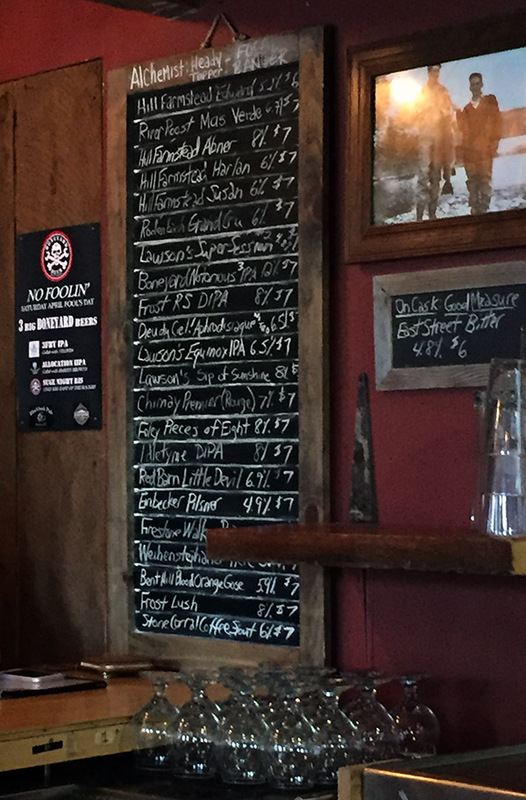 It seemed like a great day for a run on the Bruce Trail, and to add a little icing on the cake, I figured we could tack on some extra vertical and hit Old Nosedive to start the run. The temperatures were simply perfect as we gathered everyone up at the usual group meeting place by the base of the Spruce Peak lifts. We took a run on the Gondola to warm up and get us over to the Fourrunner Quad, and without new snow that we had last weekend from Winter Storm Pandora, there were no lift queues like last Sunday. In fact, there were no lift queues at all. We warmed up on Cliff Trail, and found that it was a real zoo when we got to Nosedive. I’m not sure where all the people had come from, but if one hadn’t wanted to escape to a run on the Bruce Trail before that, it certainly would have made it more appealing. 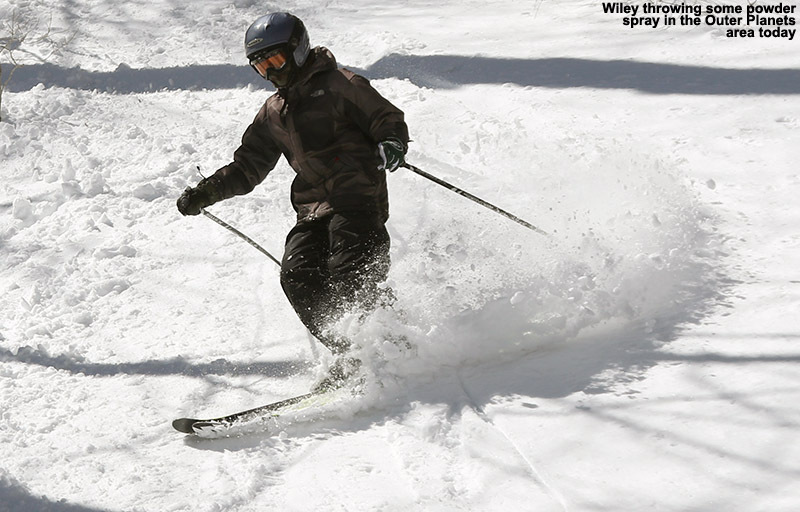 As is often the case, there was plenty of firm snow on Nosedive, and with the temperatures being so consistently wintry, it presumably had to be from snowmaking and skier traffic. We finished off the run with everyone working the bump lines on Lower National while thinking about their pole work, and the snow was much better down there. From the top of the quad we headed up Old Nosedive, and hiked a couple hundred vertical before we got to some of the narrower shots and I decided that would be enough. 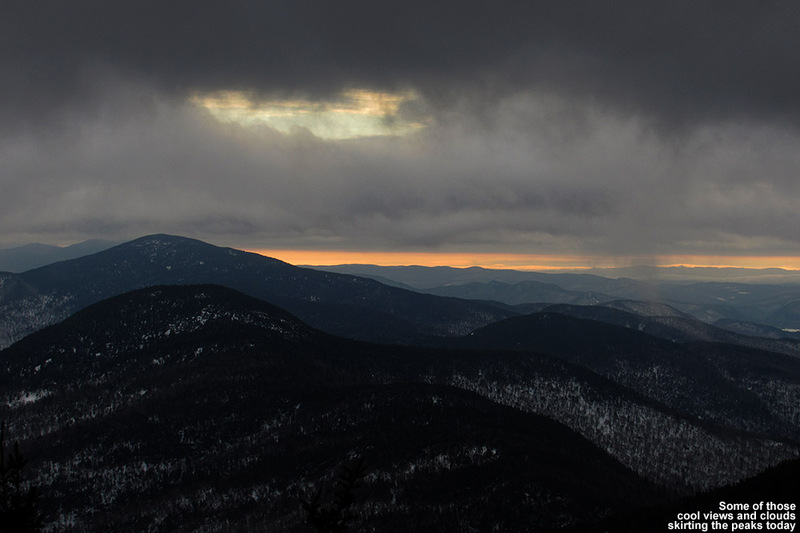 I hiked on a bit father for some of the views from the Nose, and I could see lots of clouds from our next incoming storm while some of the first light flakes swirled around me. The descent was fun, and the snow was generally tracked but quite soft. There were even some pockets of powder still off to the sides. We headed down to the start of the Bruce Trail next, and after getting a couple of photos of the group, everyone dove in. The snow on the Bruce was well tracked and generally packed, but I’ve got to say that the overall conditions were right up there as some of the most consistently awesome I’ve had on there. Since much the Bruce faces south, it’s easy for some of those steep, south-facing shots to lose coverage, or at least start to thaw and refreeze a bit, but there was none of that. The coverage was simply wall to wall on every single pitch, and there just wasn’t any firm snow anywhere. I’ve certainly had softer snow on there closer to a storm, but I don’t know if I’ve seen coverage quite this perfect. 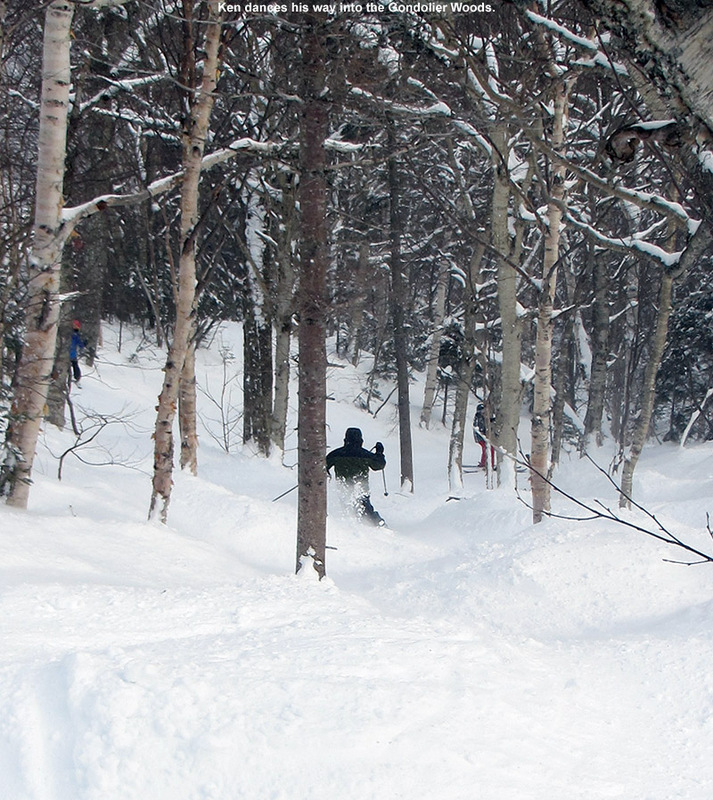 There was plenty of powder everywhere off in the trees, and as usual it was untouched. Now that I’ve done the Bruce a few times I’m starting to learn that you can ski so many of the natural trees around there that you can turn it into quite a powder run if you want to. Wiley followed me through a great streambed when we were still up in the evergreen areas, and we got some beautiful first and second tracks through there. I got more untracked powder turns down in the hardwood areas than I think I’ve ever had this far from a storm, but really all you have to do is cut off the trail in those areas and the lines are all over the place. The snow was still wintry and quite fast when we were down on the Nordic trails, and we made good time aside from the typical hijinks from the boys. We had just enough time to stop in at the Notchbrook Convenience Store for snacks before we caught the bus back to the resort. The bus dropped us off right at the temporary sport for the village fire pit, so we caught the daily s’mores for the first time this season. We hung out for a while, then some folks called it a day while I went out with the boys for one more run off Sunny Spruce. We got into the trees west of the boundary like we’d done last week, and many of our tracks were still there, only buried a bit by the few inches of snow we’ve had since then. Open areas down low had even taken on a bit of a sun crust since they face south, but I guess that’s going to happen now that we’re into March. 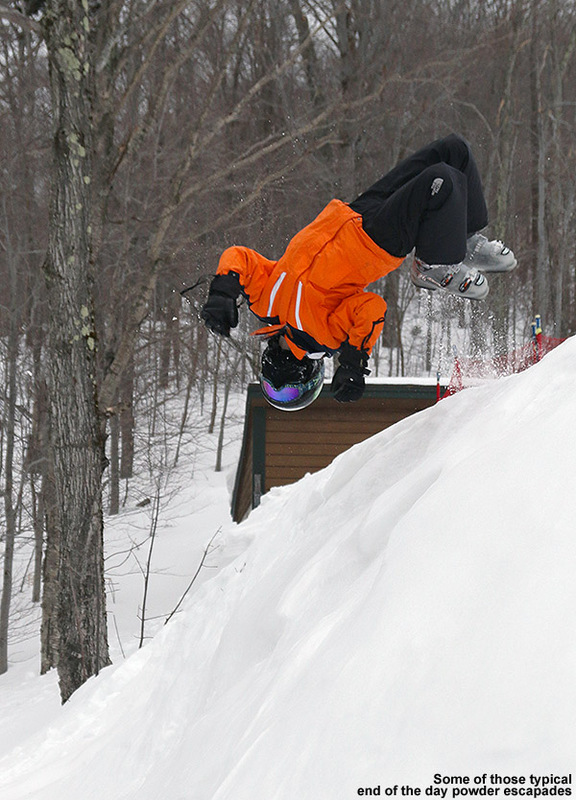 A day is hardly complete without some of those back flips into powder. It looks like the pattern of storms is going to pick back up this week, with one going on already this evening and persisting for the next couple of days, and another one later in the week. 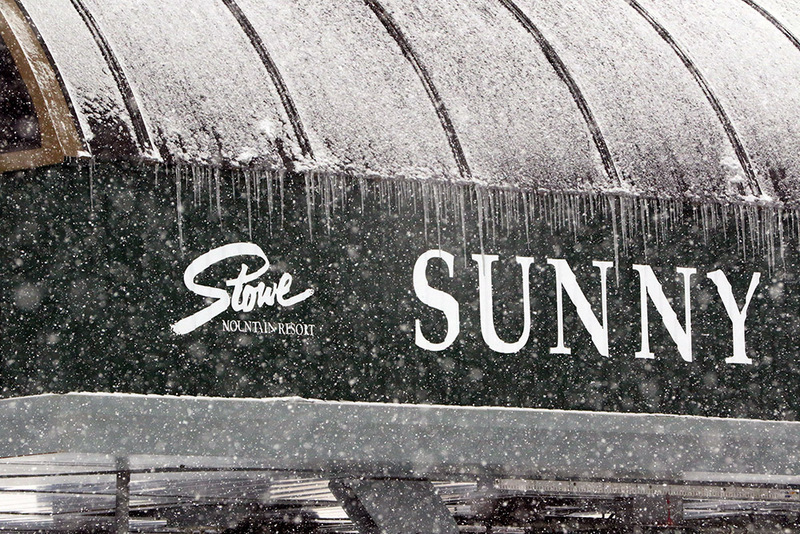 Hopefully Mother Nature can cover up those tracks for us and we’ll have some fresh lines to check out next weekend. 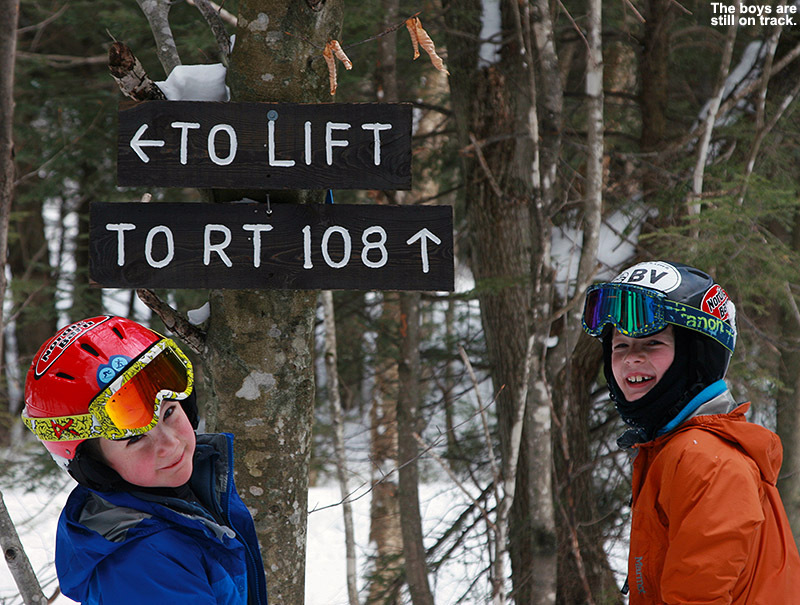 With the Easter holiday, we didn’t have BJAMS ski program today, but we decided to head to Stowe anyway for a bit of lift-served skiing and another run down the Bruce Trail. E wasn’t able to join us for the Bruce run with the kids last week because she was coaching her younger, intermediate-level students, but she had no such obligations today. 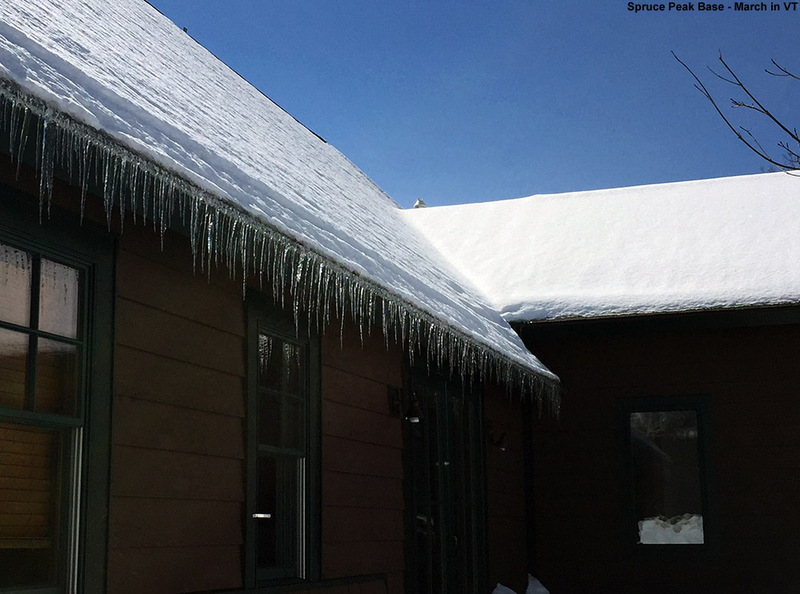 Coverage on the Bruce was excellent last week, and this week has seen fairly typical spring weather for the Northern Greens, with some snowfall and some warmer days, so it didn’t look like there would be any major changes in that department. 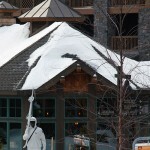 Not surprisingly, the snowpack at the Mt. Mansfield Stake is still sitting right around that 80-inch mark, so there were clearly no issues with loss of snow in the higher elevations. However, the lower mountain valleys certainly lost snow this week, brining into question the lower elevation snowpack. And, the Bruce Trail has a good deal of southern exposure, so that means that those areas are going to lose snow more quickly than other aspects at similar elevations. In fact, I was more concerned about snow coverage on those higher-elevation, south-facing pitches in the 2,000 to 3,600’ elevation range than even the lowest elevations down near 1,000’; the snow in lowest elevations of the route is well protected by the forest and well packed, so I suspect it persists quite well in the spring. Today we planned to flip our Bruce Trail tour setup from what we’ve done in the past; we’d park the car down at The Matterhorn, ride the Mountain Road Shuttle up to Mt. 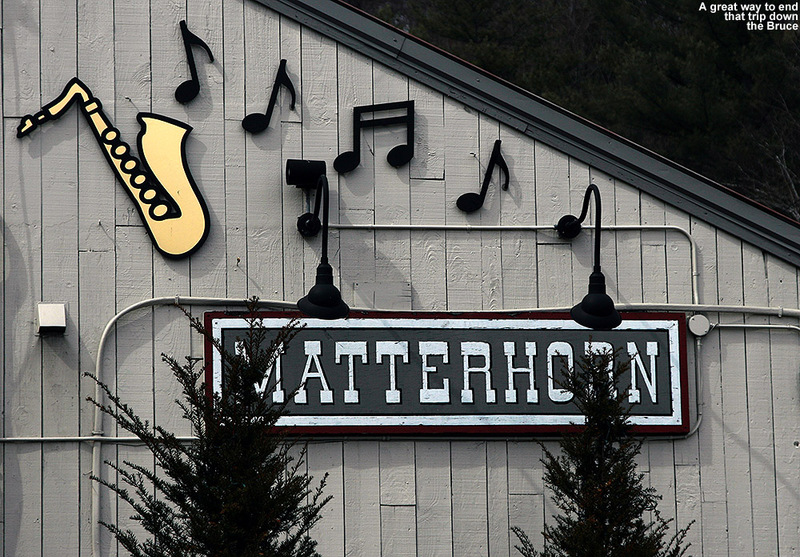 Mansfield, ski the mountain for a while, and then finish off with a run down the Bruce and a meal at The Matterhorn. We timed things pretty well with knowledge of the Mountain Road Shuttle schedule, and arrived at The Matterhorn in the early afternoon with time to get into our gear and head across the street to the shuttle stop. 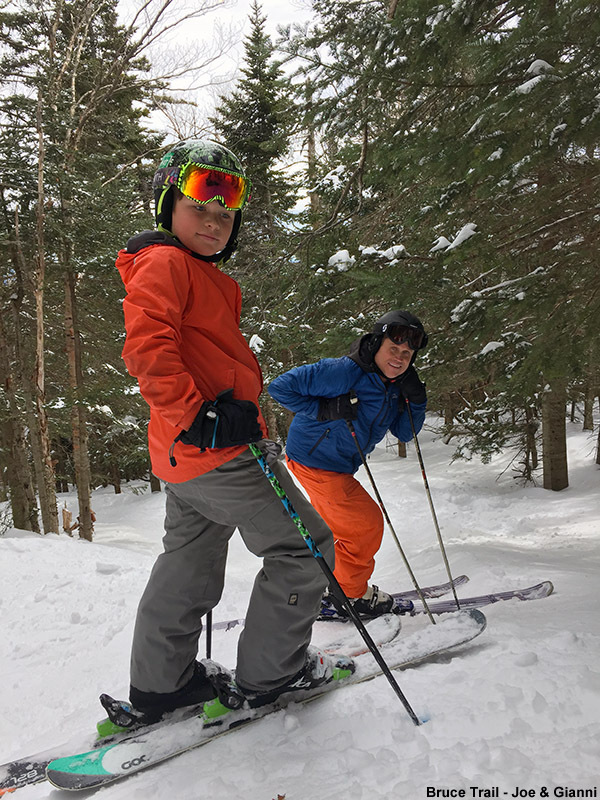 The plan was for everyone to Telemark since the boys could get in some lift-served practice runs and it’s generally a good fit for a trip down the Bruce, although Ty opted for alpine gear at the last minute because that’s what he felt like skiing. 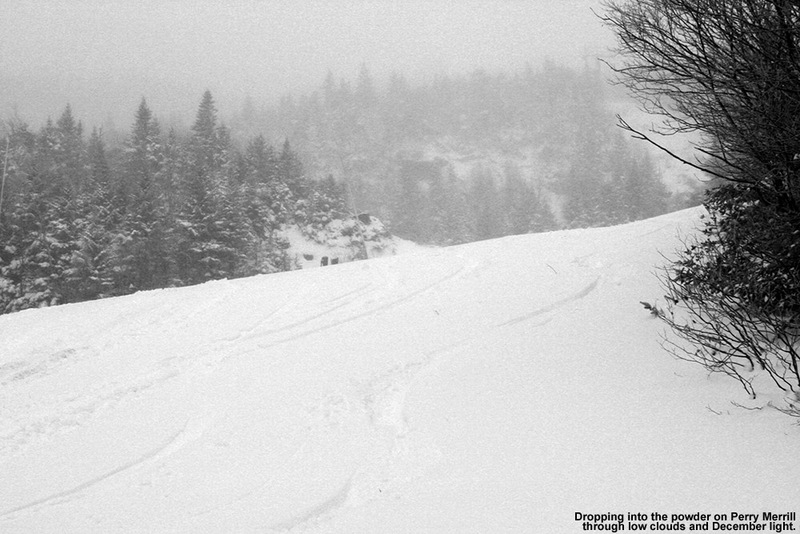 We started off the afternoon as planned with some lift-served runs, and found some marginally sticky conditions in places. None of the surfaces were too bad in that regard, but there was definitely some snow that has not transitioned all the way to corn with the rounds of snowfall earlier this week. Temperatures were a bit warmer than yesterday, sitting in the upper 40s F down in the lower elevations, and somewhere in the 30s F at the summit elevations. 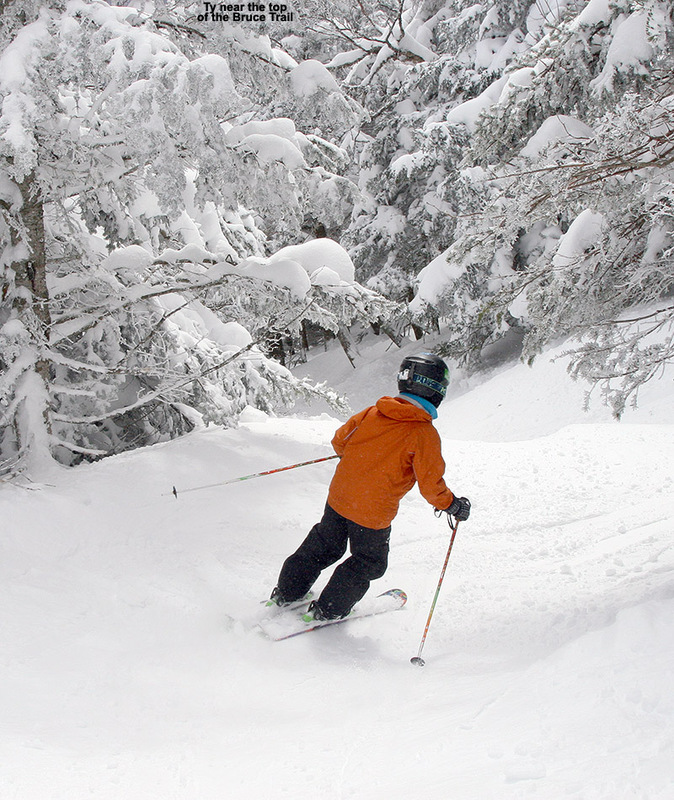 On piste coverage at Stowe remains excellent, with 100% of trails open today – it’s much more typical this season, and nothing like last season when that huge March heat wave really sapped the snowpack. Dylan worked on his Telemark turns and was making strides on his bad side turn, and Ty on his alpines was throwing himself off all the airs he encountered. Around mid afternoon we decided to head down the Bruce for our final run, and the snow was nice and soft right from the top. The only notable coverage issues were in the usual spots – those steeper pitches with southern exposure. Those areas had opened up a bit since last week, but the differences in the skiing are fairly marginal; you’ve just got to navigate those areas cautiously. As expected, the lowest elevations in the Nordic areas in the 1,500’ – 1,000’ range had perfect coverage. The only potential break in the snow cover down there is the last hundred yards or so where you use the road the leads to the Bruce House. The road has been plowed, but you can ski on the snow banks along the edge of the road and they’ll take you right out to Route 108 as usual. 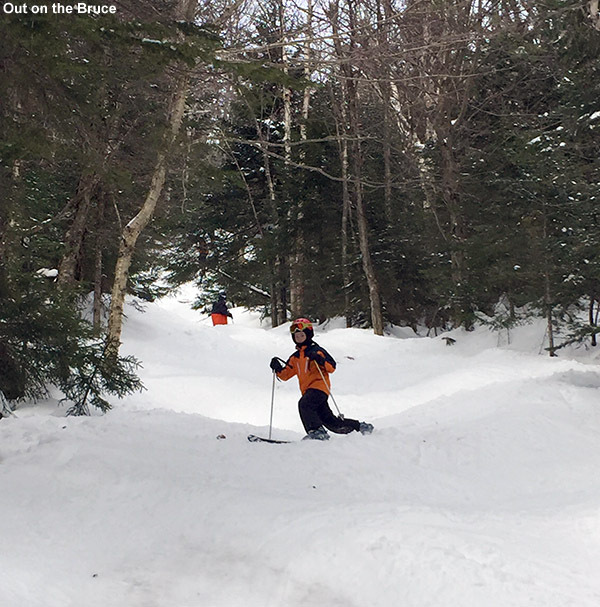 The whole trip down the Bruce was extremely quiet today – we didn’t see a single soul on the Bruce itself, and we only saw one family touring on the trails of the Stowe Mountain Resort Cross Country Ski Center. Perhaps the holiday kept the numbers of visitors down relative to a typical Sunday, but the resort looked pretty busy overall. I didn’t track today’s travels by GPS, but for a representative GPS/Google Earth map or elevation profile plot of the general route of the Bruce Trail, refer to my Bruce Trail trip report from January 21st. Dad, Ty, and Dylan celebrate finishing off another fun trip down the Bruce. It was fun to get E’s impressions of the trail since this was her first trip down the Bruce. She found, and I entirely agree, that on today’s outing the combination of the relatively narrow nature of the trail, the areas where the formation of moguls tended to dictate specific locations for turns, and the concave sculpting of the snow due to skier traffic, all come together to create quite a challenging ascent on Telemark gear. I noticed those aspects as well, and indeed in this case what is really pretty standard intermediate or advanced fare on alpine equipment, is much more technically demanding on Teles… or at least it is if you’re trying to make Telemark turns. Trying to navigate those concave edges while snaking down a narrow line (and even feeling narrower in a Telemark stance) among moguls on terrain with decent pitch will certainly push your skills. 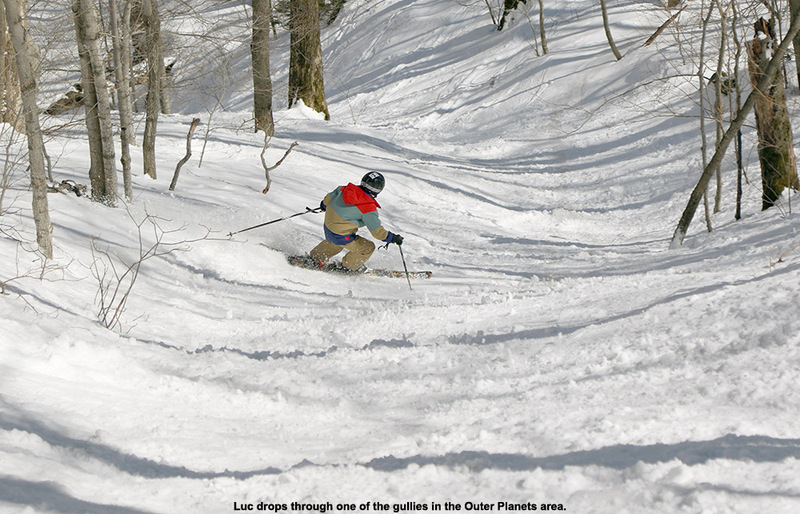 Fortunately one can use alpine turns as a fall back, and those are certainly a lot of fun too, but of course trying to be strict with those Tele turns keeps the bar up. Even with the great spring snow, E favored alpine turns heavily in the steep, upper sections of the trail, but there were plenty of areas where her Telemark turns would flow. I threw in good doses of alpine turns myself in spots, because sometimes it’s just too hard to plot a solution with Tele turns through certain areas. 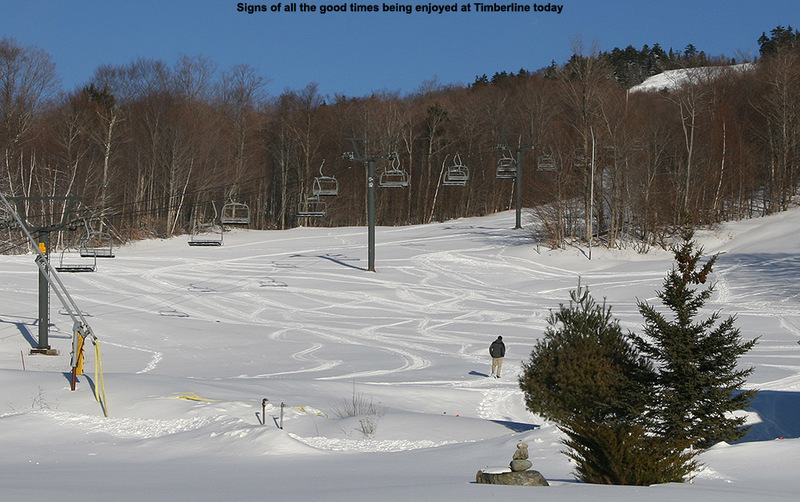 But, every run gets more turns under your belt. Dylan threw in a few Telemark turns here and there, but he already knew going in that he was going to mostly alpine and just enjoy the ride in that fashion. T he final part of today’s outing was an early dinner at The Matterhorn. 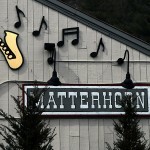 I’ve actually never eaten at The Matterhorn, since I’ve thought of it generally as an après ski bar. As it turns out though, they’re a restaurant as well, and to my amazement, they’re pretty well known for their sushi. I tried for a visit to get some sushi back on Bruce Trail trip on January 21st, but the sushi bar is closed on Mondays, so I decided to wait until my next visit. Well, today was that day, and I’ve got to say that indeed the sushi was quite good. I went with a Salmon Maki Roll and one of their specialty rolls, the Crab Rangoon Roll, and both were great. E and the boys didn’t get sushi, but everything we had was good. 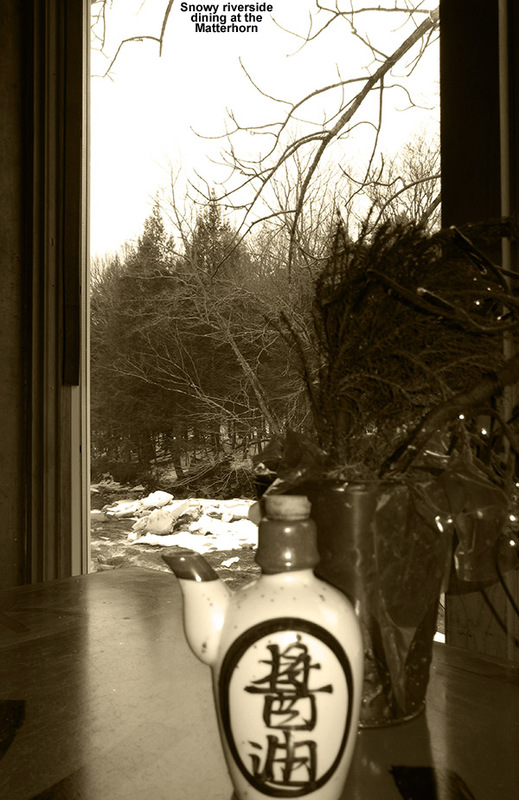 Sitting out back by the river is also a nice perk – there was a feel of early spring watching the water roll by amidst the snow. Based on forecast for the coming week, I’d say the Bruce will probably still be good to go next weekend as well, so keep it in mind if you’re looking for something to do as we move on to April skiing in the Northern Greens. 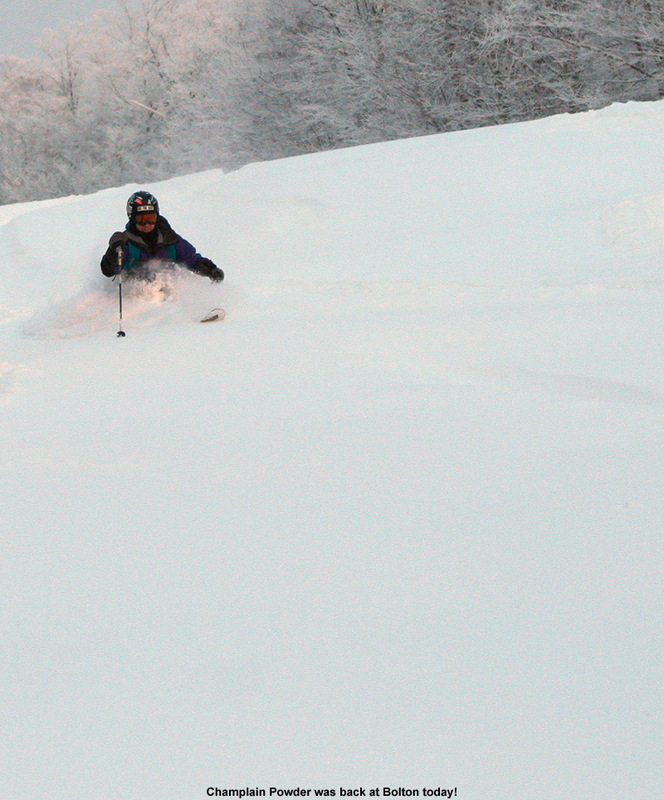 Ken tests out the powder landings above Green Acres. I made a Bruce Trail reconnaissance run back in January, and since then we’ve been waiting for the right combination of snowpack, weather, and coach availability to bring our BJAMS group for a trip down the Bruce. 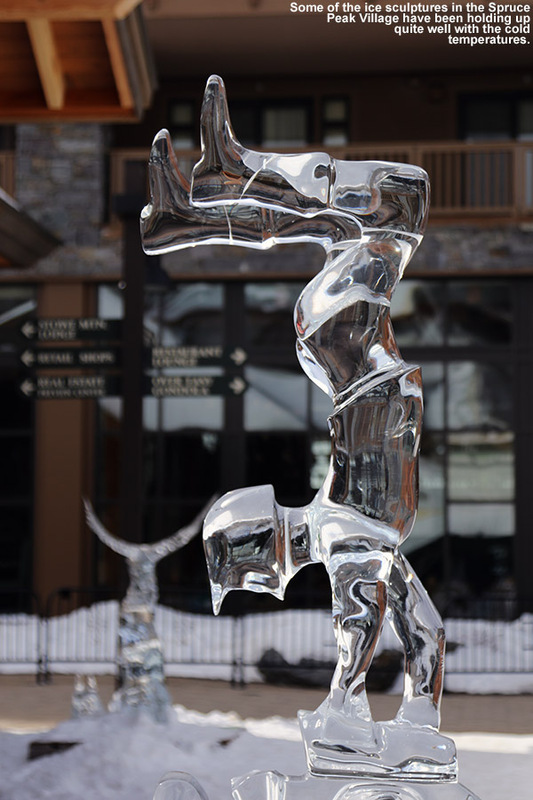 A couple weeks ago, the forecast began to suggest that the snowpack was just going to continue to build through March, so we decided to bide our time. 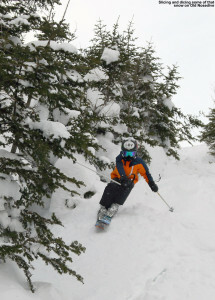 Indeed as the forecast suggested, this “powder week”, with between 30 and 50 inches of snow at the Northern Vermont resorts along the Green Mountain spine, has bolstered base depths. 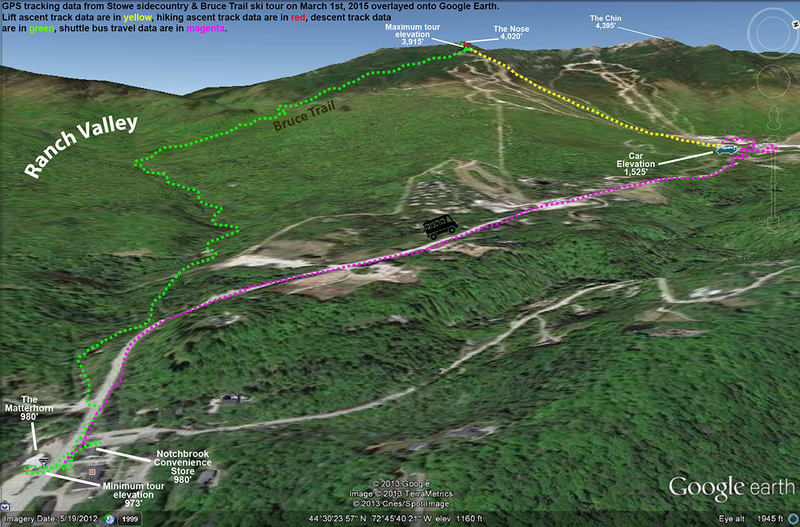 One result of all that snow has been the growth of the snowpack at the Mt. Mansfield Stake; it’s finally crept above average this week, reaching a depth of 82 inches as of yesterday. 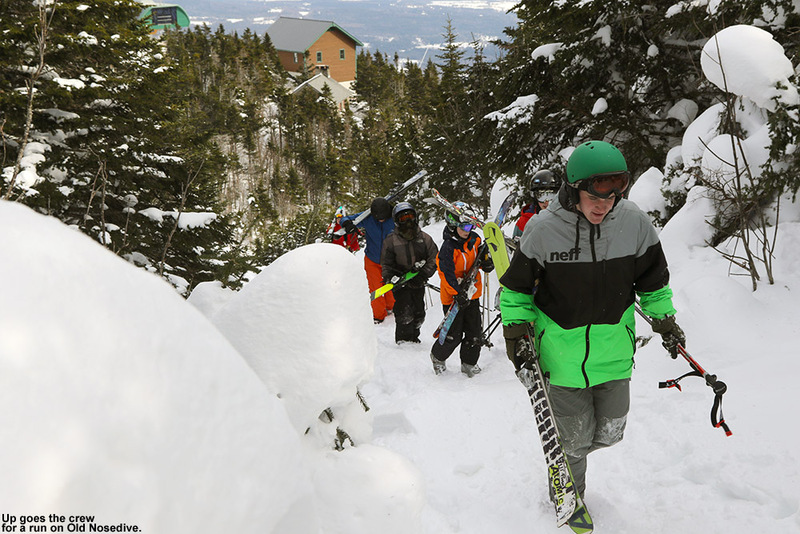 With excellent snowpack now all the way down to the mountain valleys, a forecast for partly cloudy skies with temperatures around 30 F, and good availability of the BJAMS ski program coaches that wanted to ski the Bruce… today was the day for our trip. We had a little time before our group got together, so we did a warm up run on Sunny Spruce with Connor and his dad. As expected, the snow quality was excellent – it was packed powder on the trails and powder off piste, with just a few bare spots here and there on steeper south-facing terrain like Freddie’s Chute. One of the highlights of that run was West Slope, where we rode the ridge along the skier’s left with big swooping drops into the chowder on the left side. At one point I heard Luke screaming out behind me something like “That was so intense!” after launching a huge drop on one of his turns… intense indeed! We gathered up our group, which featured Claire, Ken, Julia, Luke, Ty, Dylan, and me. Along with Joana and big Luke, we were missing Joe, Sam and Ethan today, and I suspect they would have loved to make a run down the Bruce, but hopefully they’ll get to do it next time. Apparently Joe did have a great day out on the mountain on Friday with Ken though, so he’s had a good dose of all this new snow. We debated briefly about whether we should do our Bruce run at the beginning of the day or the end of the day, but with some folks having obligations preventing them from lingering at the mountain too long at the end, we decided that we’d better start with the Bruce and fill extra time in with some other runs at the end of the day. Based on my reconnaissance day, I was going with a fairly conservative estimate of two hours for us to complete the run to the base of the Bruce. I knew there wouldn’t be any problems for anyone in terms of the skiing, I was just unsure about what our pace would be through the flatter terrain in the Nordic areas. If the kids found it tiring it might take longer than what I’d experience on my own, so I figured it was better to be safe than sorry. Luke, Julia, and Dylan make their way down a narrow section of the Bruce Trail. We didn’t waste any time getting to the top of the Bruce, we crossed on the Over Easy and went right up the Fourrunner Quad. 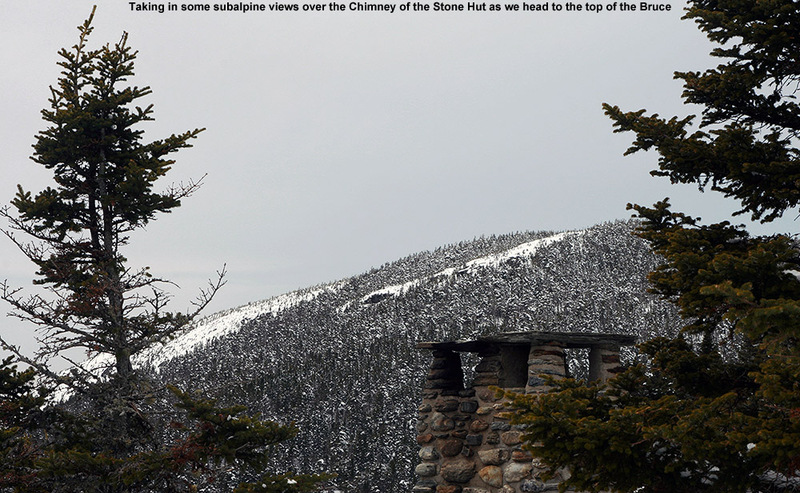 Unlike down in the base elevations, there was a brisk wind up there around 3,600’. Some of the boys dropped in the alternate entrance to the Bruce for a bit of powder and I grabbed a few pictures there and some more as they dropped below me on the trail. It was packed snow on the trail, but the quality was excellent, far better than what I’d experienced on my January trip, which was after a thaw the previous week. The skiing in the upper sections went pretty much as expected, the boys were having a blast with the bumps and jumps, and one could explore the powder off to the sides when areas opened up in the trees. A few of the steepest pitches were a little scraped down in spots, but that was pretty minimal because of the deep base and recent snow. As we got down into the hardwoods and the forest began to open up even more, I started venturing father off the trail into powder lines based on my previous knowledge. The powder was generally a foot plus in most places, and that worked well on most pitches – enough to slow you down on the steeper stuff, but not bog you down too much in the mellower areas. Down on the Nordic trails, the final, flatter part of the descent went very smoothly. Ty noticed one of those wavy green lines one of the trail signs, indicating beginner Nordic terrain, and with regard to the perceived flatness he said, “Oh no, that type of sign is never good!” I’d say he found out that it really wasn’t that bad. The kids did a nice job of keeping their pace on the flatter areas, and I’d give Ty and Dylan occasional boosts to keep their pace up. They started to play around and get tangled up with each other as they skated and poled their way down the trail, so that kept them entertained even on the flats. As a bonus we got those beautiful views of the snowy Ranch Brook, and the snow stayed quite powdery all the way down to 1,000’. All in all that had to be just about perfect conditions today for skiing the Bruce, comfortable temperatures, partly cloudy skies, and dry snow all the way to the base. I’m not sure what more one could ask for aside from getting first tracks! Riding the Mountain Road Shuttle – it’s almost worth doing the Bruce Trail just for that! From leaving the Spruce Peak Base to reaching the bottom of the Bruce at Route 108, it had taken a bit under 90 minutes, so we made it well under my two-hour conservative estimate, even with the large group. We were about 20 minutes ahead of the next Mountain Road Shuttle when we reached the end of the trail, so we popped into Notchbrook Convenience Store for some snacks, and enjoyed the early spring weather while we waited. The March sun is quite nice right now, and it’s the beautiful sort of weather that is keeping the snow dry instead of sticky, even with relatively warm air. Ty and Dylan loved the ride on the shuttle, and Ty only half jokingly insisted that “The Bruce was nice, but it’s the bus ride that’s really my favorite part of the trip.” He certainly does like to ride buses. 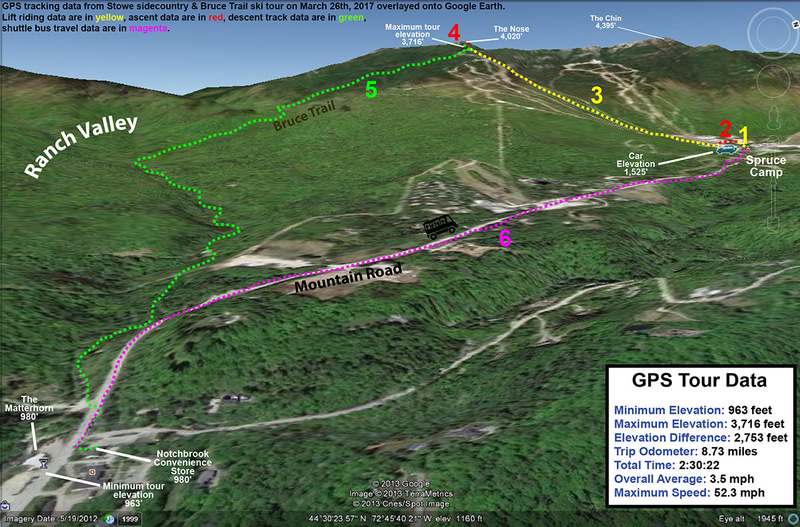 For a representative GPS/Google Earth map or elevation profile plot of the travel circuit we used to ski the Bruce Trail, refer to my Bruce Trail trip report from January 21st. Luke comes out of a jump turn in the Green Acres area. When we arrived back at the Spruce Peak Base Area, we had another hour or so before the lifts stopped running, and we decided to use our remaining time for a trip over to the Sensation Quad. 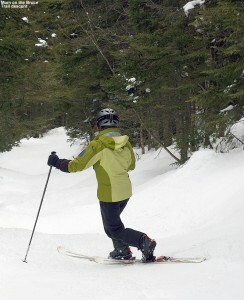 With the relatively deep March snowpack, it seemed like a good time to ski as much of Spruce Line as we could. The strengthening sun is only going to start beating on that south-facing terrain more and more. I was surprised to find that the steep terrain above Green Acres was fairly wind scoured, but we found a line through and the boys did some great steep turns and jumps off one of the rocks there. Dylan led the charge with an impressive jump turn off the rock, landing in a sea of deep powder. He was followed up by the other boys, including Luke who was totally jazzed at how high he went. 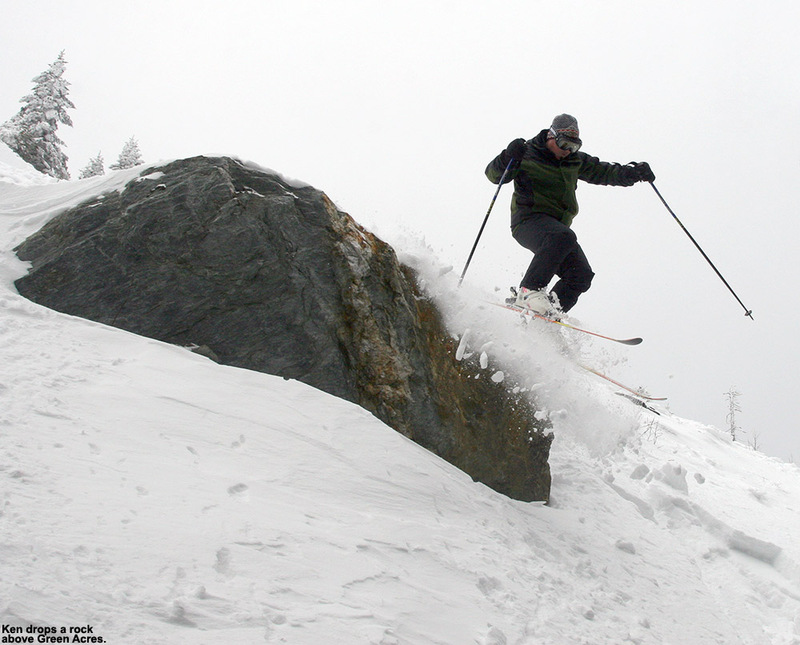 That steep pitch used to intimidate him, and now he’s launching huge jump turns off boulders into powder. 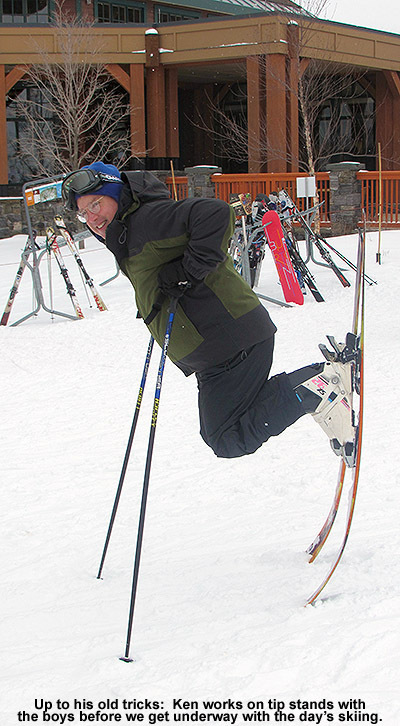 It’s great to see him expanding his skiing literally by leaps and bounds. Ken launched a beautiful air off the rock as well, although he had to deal with sloppy fourth or fifths in terms of the powder on the landing. 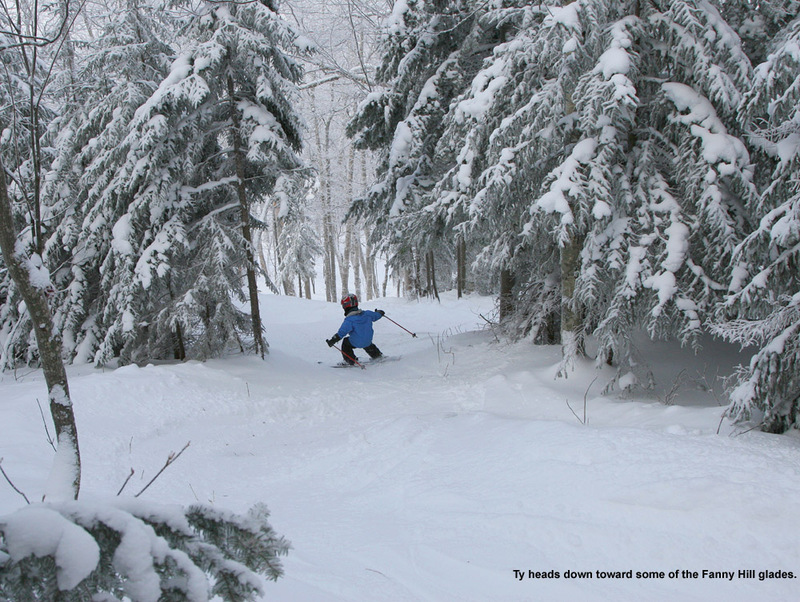 The snow in Green Acres was excellent – powder of well over a foot in depth, which was plenty to slow you down in some of those tighter tree lines. We couldn’t ski all of Spruce Line because parts were closed, but we did get the middle section that was fairly lightly tracked with some beautiful snow. 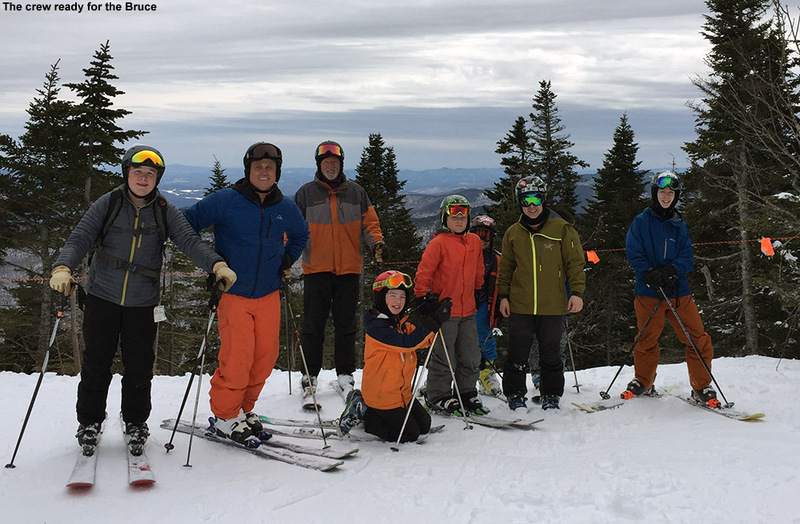 The group also enjoyed the chance to ski Main Street since there weren’t any races taking place – having Main Street open up for general traffic is one of those great things about approaching the spring season at Stowe. While most of the group had to leave a bit early, Ty, Dylan, and I found time to squeeze in one more run on Sunny Spruce. 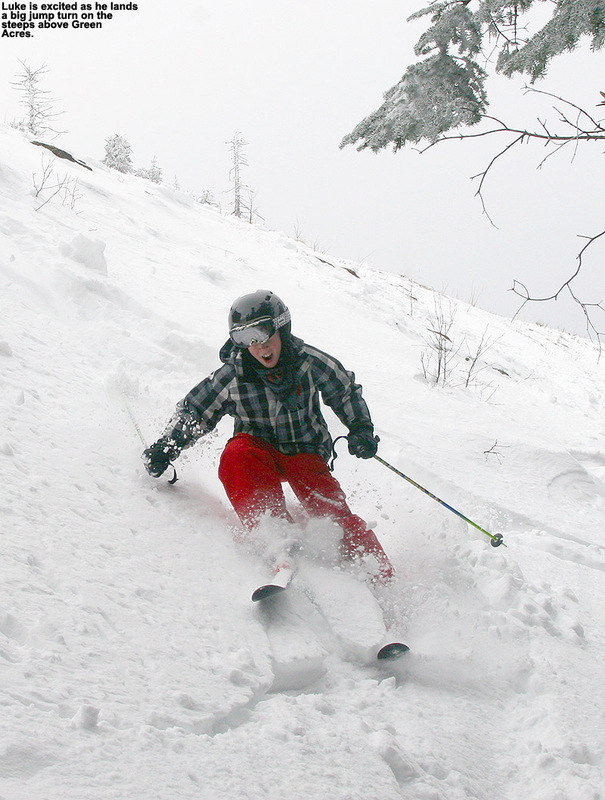 We dropped into Freddie’s Chute, and Dylan worked his way to the woods on the skier’s right for some powder. He ended making an impressive drop off a log, which had to be 8 to 10 feet high. He did manage to hit his chin with his knee on the landing, and it wasn’t of any consequence, but I did stress the point of being aware that that can happen and making sure that your tongue is not anywhere near your teeth. That was really an aggressive drop that he made, and between Bolton yesterday and Stowe today, he’s really been on fire with the airs this weekend. 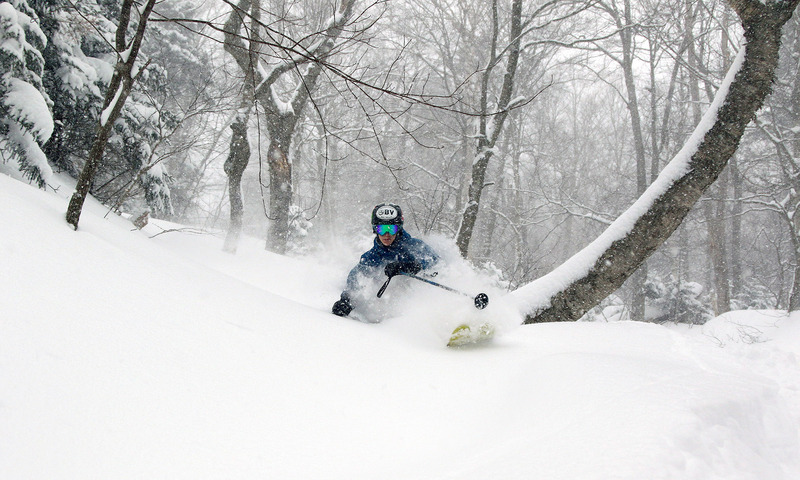 With deep bases and deep powder though, ‘tis the season for such things. We followed that up with some exploration of the trees off to the skier’s left of Lower Smuggler’s – a section that none of us have ever explored before. We found some good lines, with just a bit of a slow exit on flat terrain. We finished off with a final descent down West Slope, making use of that ridge and flying off the edge into the powder. 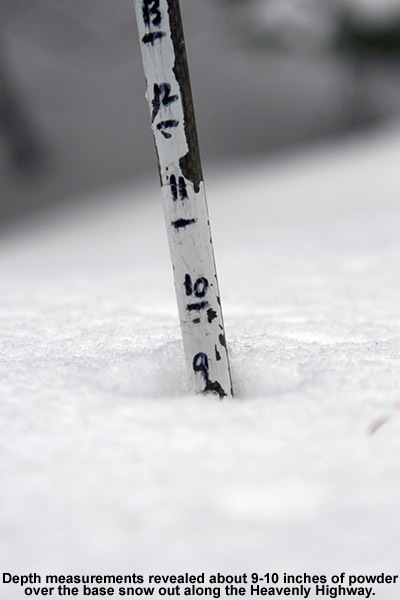 I just checked the forecast, and we’ve apparent got more snow on the way this week. Nothing too big is expected, but the mountains often seem to do a lot with just a little moisture in the forecast. Indeed this is turning out to be quite a March for skiing in the Northern Greens as we make up for the rather paltry snowfall of January and February. 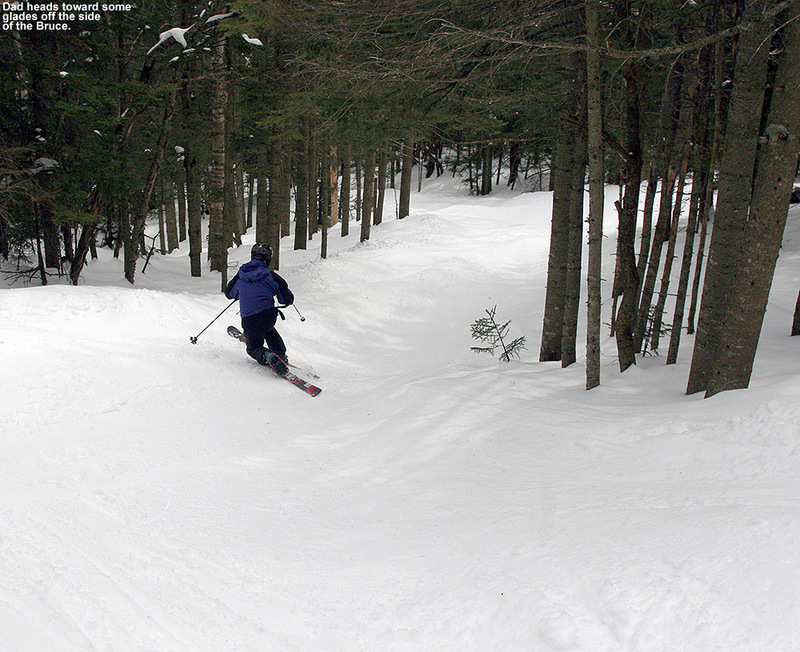 Conditions are outstanding right now at Stowe – Ken demonstrates as he drops into the Gondolier Woods. 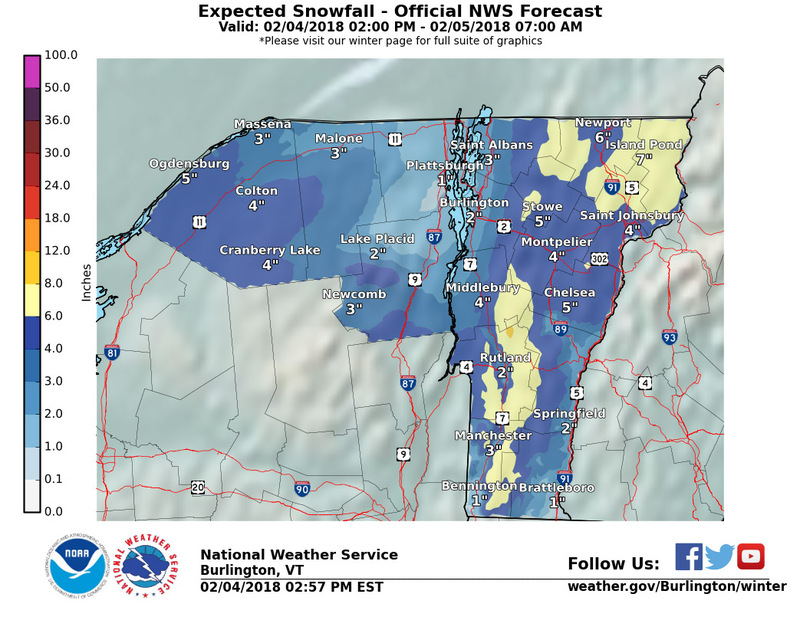 We’ve been under the continued influence of an upper level low pressure system off to our northeast for the past couple of days, and it’s brought persistent light snows to the mountains and even the valleys in Northern Vermont. 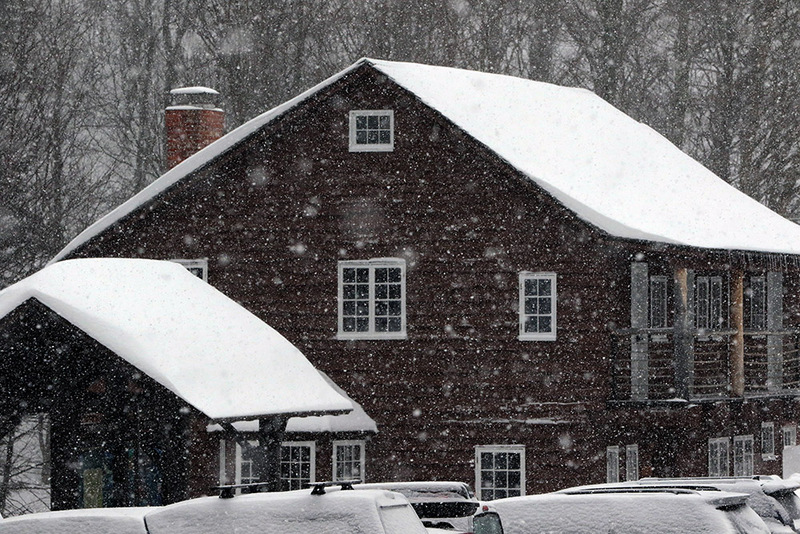 As of this morning we’d picked up a couple of inches of snow here at the house, and the mountains had received up to 7 inches of powder. The snowfall was fairly robust up around 3,000’ yesterday when I was out in the Bolton Valley backcountry, and although it had tapered off somewhat today, we knew that conditions were going to be good with the consistently wintry temperature regime we’ve had. 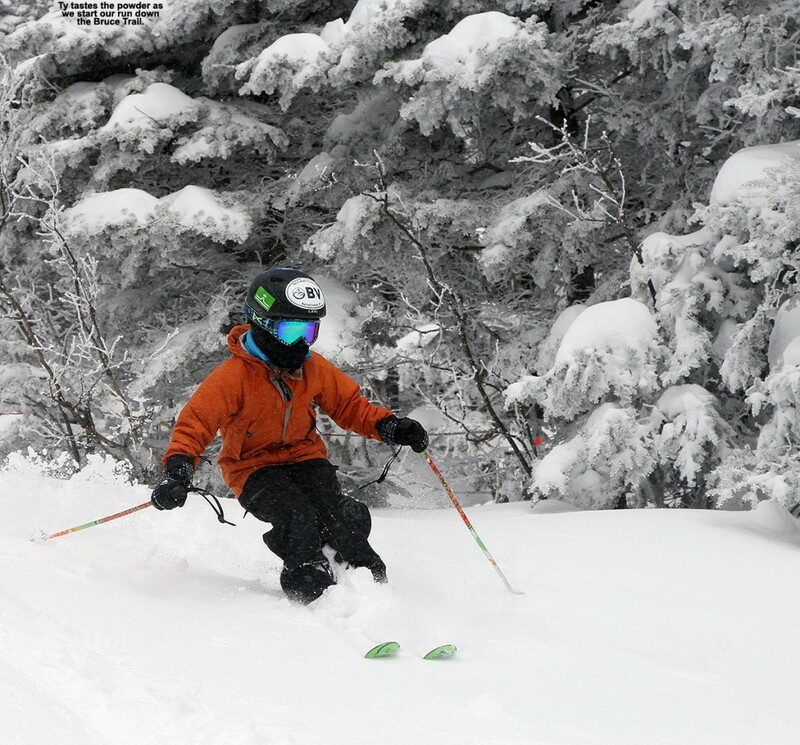 Today was BJAMS ski program day at Stowe, and based on the latest report from Powderfreak yesterday, we knew the skiing was going to be excellent. 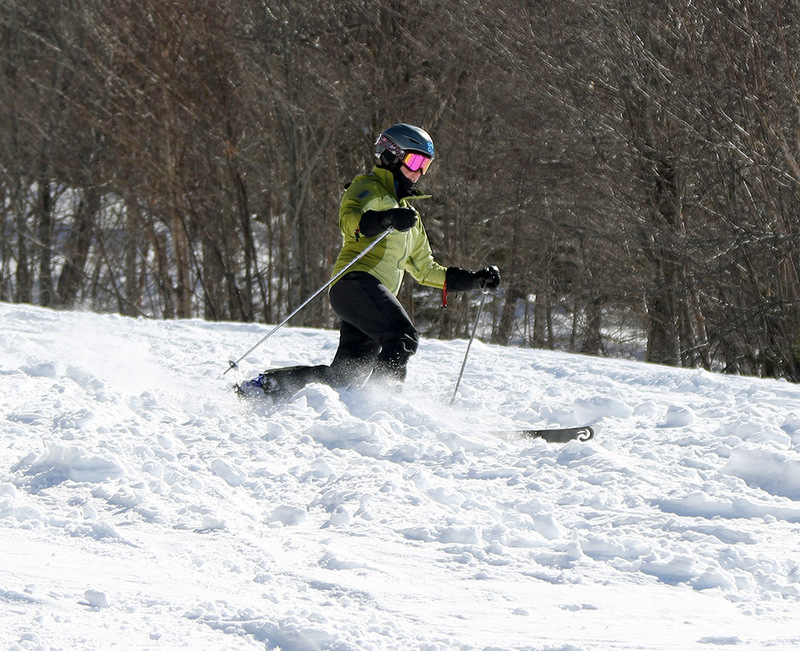 Claire recently returned from her trip to Africa, so we headed off to Stowe a bit early to make some initial “face time” ski runs that E and Claire could use to catch up on program coordination. We did a couple of laps off Sunny Spruce with the boys, and the conditions were fantastic as expected. The groomed surfaces were all packed powder, and the edges of the trails and the off piste areas were providing ample powder. 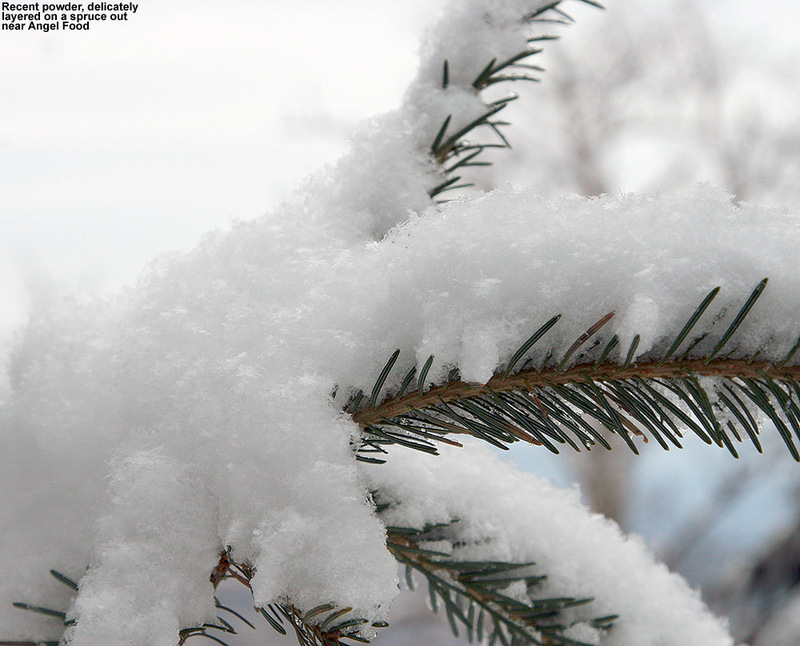 I did encounter a bit of firmer snow beneath the powder on the open slopes above Meadows. Signs of that melt layer from last week’s bits of low-elevation warmth are certainly getting buried with the continued rounds of light snow, but low elevation and south facing areas still have some of that underneath. 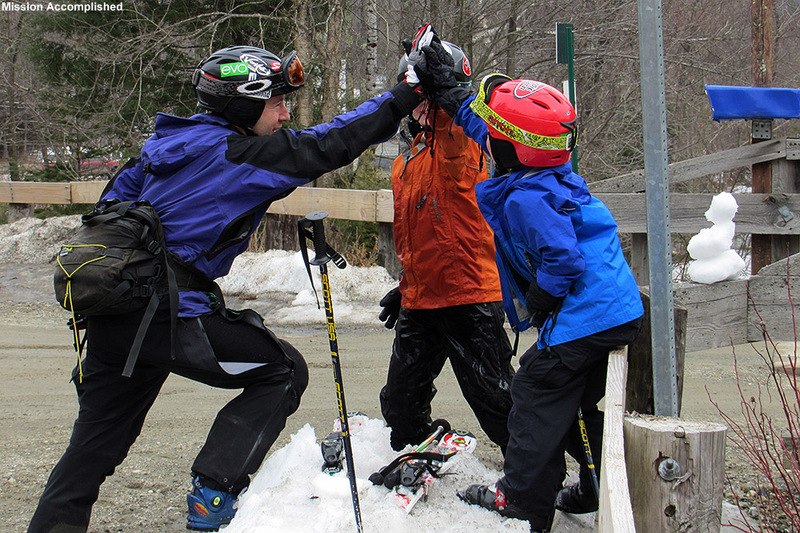 Ken keeps the boys on their toes as we get ready for the day’s ski session. When it was time for our session, we gathered up our main group, which consisted of me, Ty, Dylan, Luke, and Ken. We chatted with Joe and his group about joining up for some runs – we heard about how much fun they’d had in the Chin Clip Streambed, and figured that they would love Angel Food. We were anxious to get Ken a run out there, so it was high on our hit list for the day. Our first run up on the docket though, was Spruce Line; that was Ty’s request, and we figured that we should get it in before we headed over to Mansfield. We teamed up with Joe and his group right away, since they wanted to ski that area as well. We were even able to take Horse Barn Chute on our way over; since coverage is really good right now, and that area has filled in well. From the top of Sensation we dropped into Green Acres, and Luke was very excited to be making turns down that first steep face that has intimidated him in the past. The snow in the trees there was outstanding, with a few inches of untouched powder on the main lines, and bottomless powder off to the sides. It seems like there’s been very little traffic in there as of late. In order to attempt the lower areas of Spruce Line, we connected back to Main Street, but we found the entrances to those lower areas closed (possibly because of the race taking place on Main Street) and took it as our cue to head over to Mansfield. 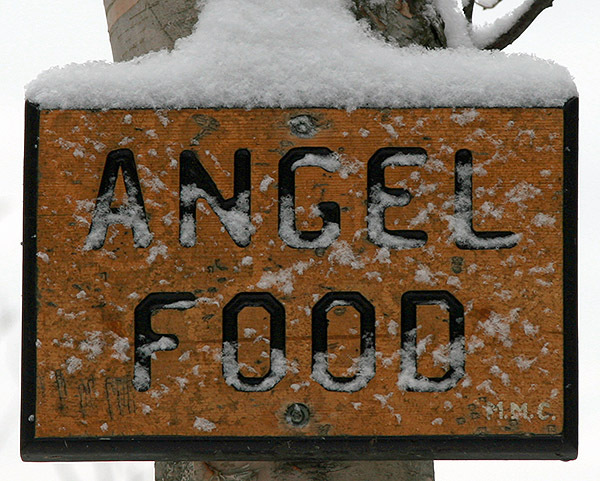 We decided to get right on with our plan to ski Angel Food, since it wasn’t the sort of endeavor I wanted to tackle late in the day with a group of eleven, most of whom had never been out there. As it turned out, we were going to appreciate that cushion of time. 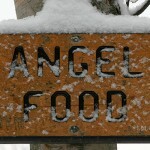 Our first snafu took place just as we were finishing the traverse out to the top of Angel Food. Joanna dropped a bit too low on the traverse, and wound up being committed to a lower line. Ken decided that he’d better accompany her to make sure everything went smoothly – it’s roughly a mile of distance that needs to be covered to get out of there, and the route is through forested terrain of varying densities that is typically filled with deep powder. It’s important to have a sense for where you are going, so Ken’s choice was apt. And then there were nine. The general descent of Angel Food went fairly smoothly for the rest of the group, and Joe and everyone else experiencing the area for the first time were simply having a blast. Joe was amazed at how deep and plentiful the snow was out there – he said it reminded him of Lake Tahoe, and I let him know that it’s one of the reasons people are so enamored with the skiing on that part of the mountain. That area beneath The Chin gets perhaps the most snow at the resort, on a mountain already known for getting a lot of snow. Indeed the conditions out there have just been getting better and better as the snow’s been piling up over the past month, and it was packed powder all around on the main line with virtually limitless options for powder off to the sides. Our next snafu began when we just missed the main traverse back to the gondola base. I quickly got the word out that we should start traversing hard on our own, but Ethan missed that announcement and was already a few dozen yards below us. I started a fresh traverse through the powder, with the other folks following me, and we instructed Ethan to start his own traverse below. I cut a pretty hard traverse that was doing a good job of getting us back on track, but Ethan’s traverse was not quite as strict, and before long he was a hundred yards below us. There was no way he was going to get back up to us in a reasonable amount of time. I decided that we needed to keep the entire group together, and if it meant taking one of the lines all the way down to the notch and lengthening our run, then that’s what we’d do. It’s one of the reasons we made sure we had the extra time. 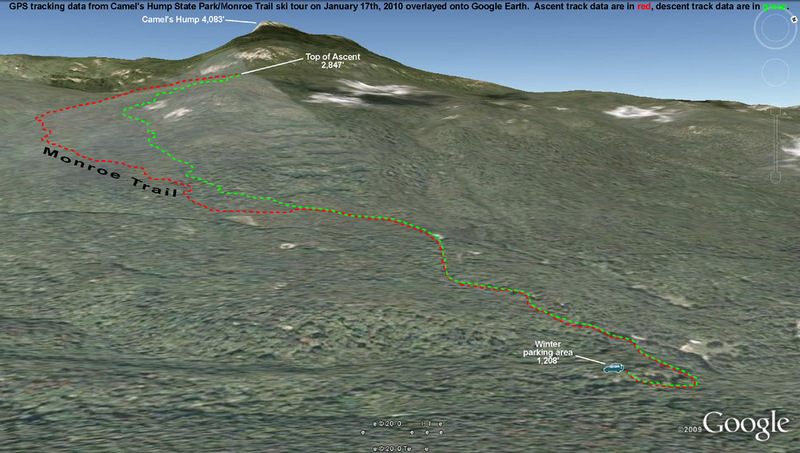 The bonus result of the situation of course was that we got to ski a fairly steep, very lightly tracked line. It’s one of the multitude of fantastic lines that one might ogle when they’re out there, wondering where they go… and we got to find out. As it turns out, it still has a traverse that gets one back onto the main line, and we had Ethan to thank for the discovery. I’m sure it’s got a nice name given by someone that worked hard to create such an excellent piece of ski terrain, but “Ethan’s Chute” is going to be our name for now. Honestly, today’s explorations only reinforced the fact that it could take years to really piece together the hundreds of acres of glades, chutes, and everything else that is out there. 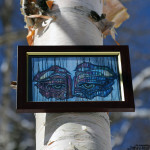 Thanks to today’s explorations though, we were able to add another small piece to the puzzle. Ken and Joanna had made good time on their descent, which was somewhere inside of ours and more proximal to the resort, and Ken said that although there was still some undergrowth on their route like we’d experienced a few weeks back in the Bench Woods, they encountered just ridiculous amounts of untracked powder. Sam had battled just a little too much powder and a few too many trees on our Angel Food descent, so Joe brought him back over to Spruce for a break, and Joanna and Julia had some runs they wanted to do on their own, so we were down to a group of seven. After the long Angel Food adventure we decided to slow it down a bit by taking a standard run on Waterfall and Gondolier, and then giving the boys a break in the Midway Lodge. Waterfall had absolutely excellent snow after just a couple of windswept moguls at the top – it was soft packed powder with a few inches of new powder sifted in on top. It’s almost hard to get a handle on just how good much of the mountain is skiing right now – each new line we try seems to deliver. We generally stuck to Gondolier for most of that descent, but some of us couldn’t help but get sucked into the Gondolier Woods for at least part of the run. That terrain was already in good shape a month ago, so it’s not hard to figure out how good it’s getting now. 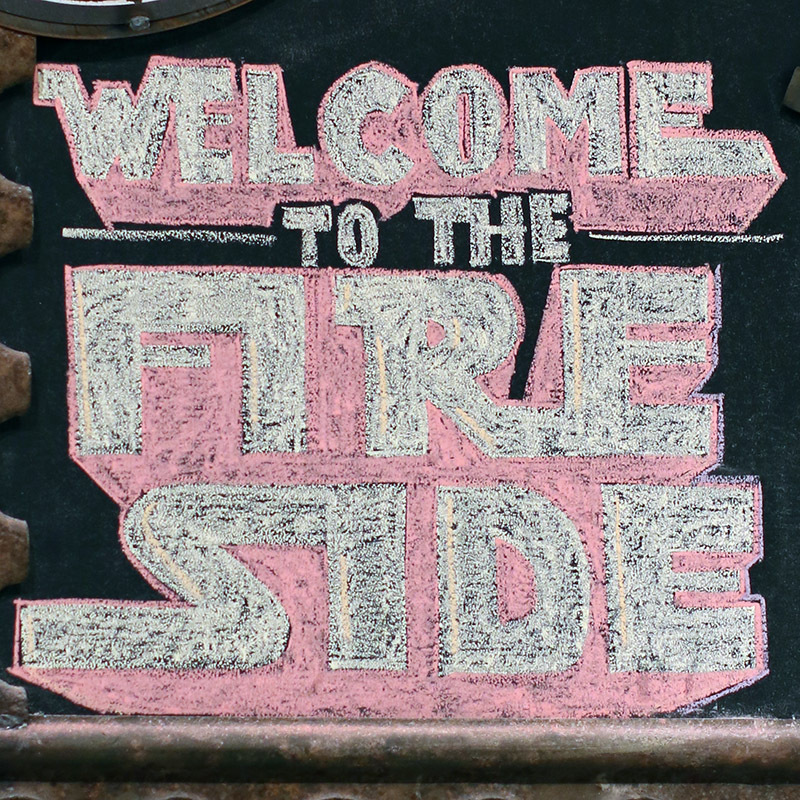 As we sat in the Midway Lodge, taking our break by the fireplace (which I think is becoming a favorite spot for Ken as well as me) we threw around ideas for our end game. 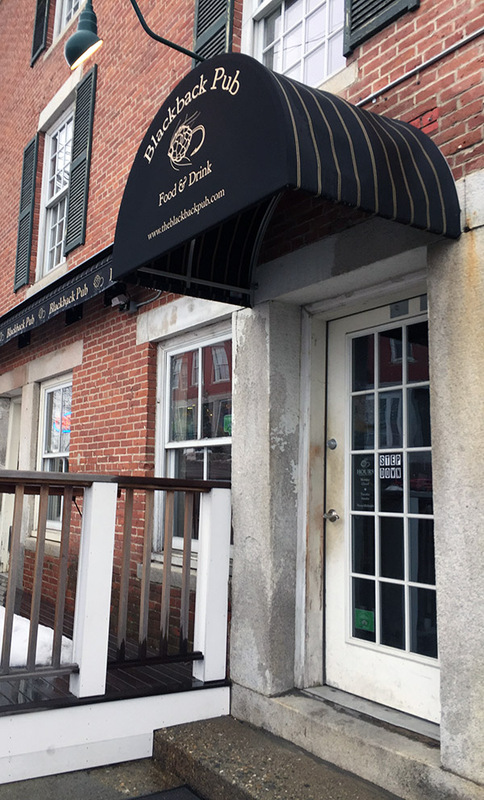 We’d have time for just a run or two, and we ultimately decided to traverse over to the Fourrunner Quad and catch either Lookout or Hackett’s Highway. Lookout was closed from the top, so we wound our way down to Hackett’s, again visiting some of those Lord Trees that we’d explored last time. Ty had quite an exit there, dropping a six foot cliff back onto the trail area, and nearly landing on a rock, but he pulled it out. Hackett’s was in nice shape, and we coupled it with some Hackett’s Highway Trees as we made our way to Crossover and back to the Spruce Peak Base Area. On the way home, E and the boys and I stopped off for some dinner at Piecasso, and while we were there discussing the day’s exploits on the slopes, a gentleman sitting at the table next to us with his family, overhead us and asked about conditions. 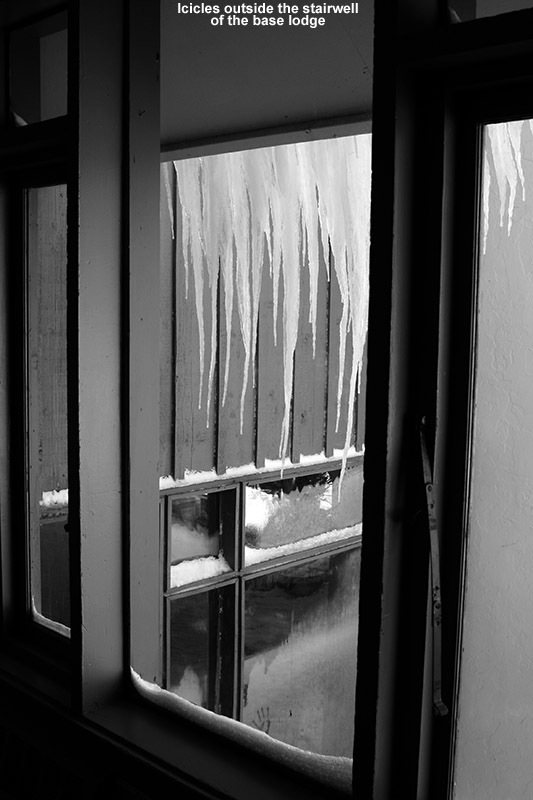 He said that they had just arrived in town, and that they were concerned about the amount of snow that they were seeing, wondering if there was going to be enough on the slopes. I was surprised, because Stowe actually has decent coverage in town – I’m sure it’s below normal for this time of year at a bit less than a foot (March 3rd is actually the peak for snowpack at our house, and that’s typically around two feet), but everything is well covered and white thanks to the recent light snows. Depending on where he came from though, he may have seen some rather meager looking snowpack in places. 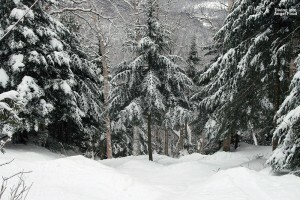 I assured him that the mountain was very well covered, and that there was over five feet of natural snowpack at the Mt. Mansfield Stake. 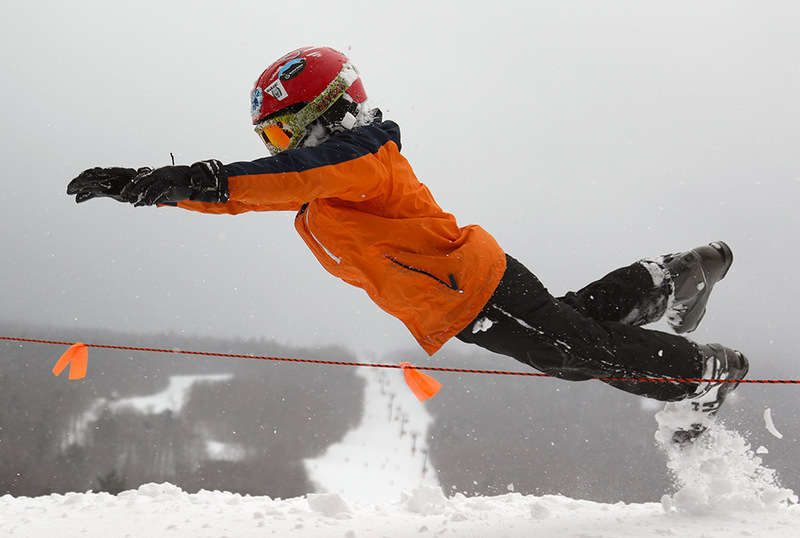 I’m not sure where that family was from, perhaps Quebec based on the accents, but they should have a classic, fantastic Stowe experience this week. We’ve got a couple more days of this light snow, then some clear days are expected at the end of the week, and there’s the potential for a larger snowstorm next weekend. 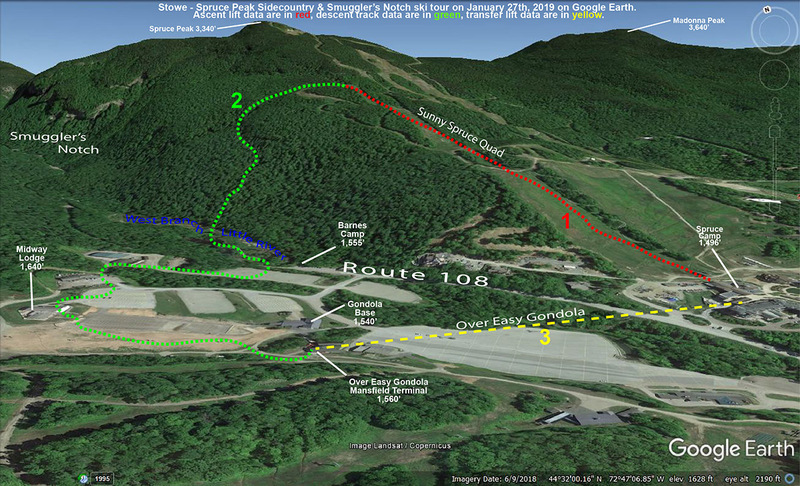 I’m looking forward to making turns next weekend already.